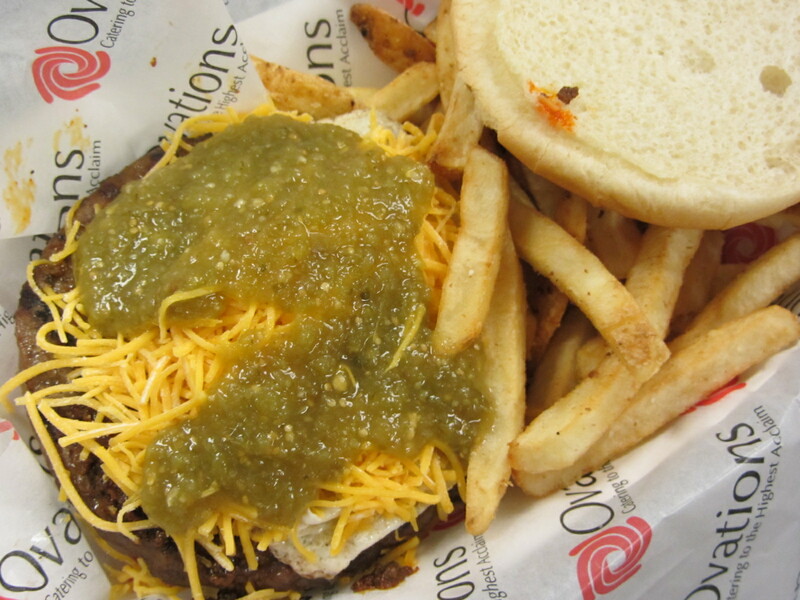 The El Paso Chihuahuas have really, really good ballpark food. 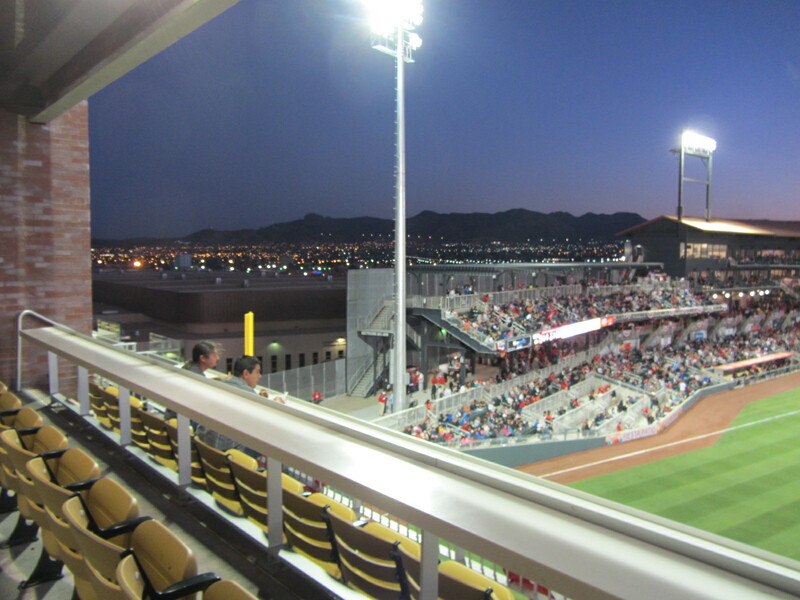 Like, really good, easily within the top five of the 110 or so ballparks that I’ve visited over the past five seasons. 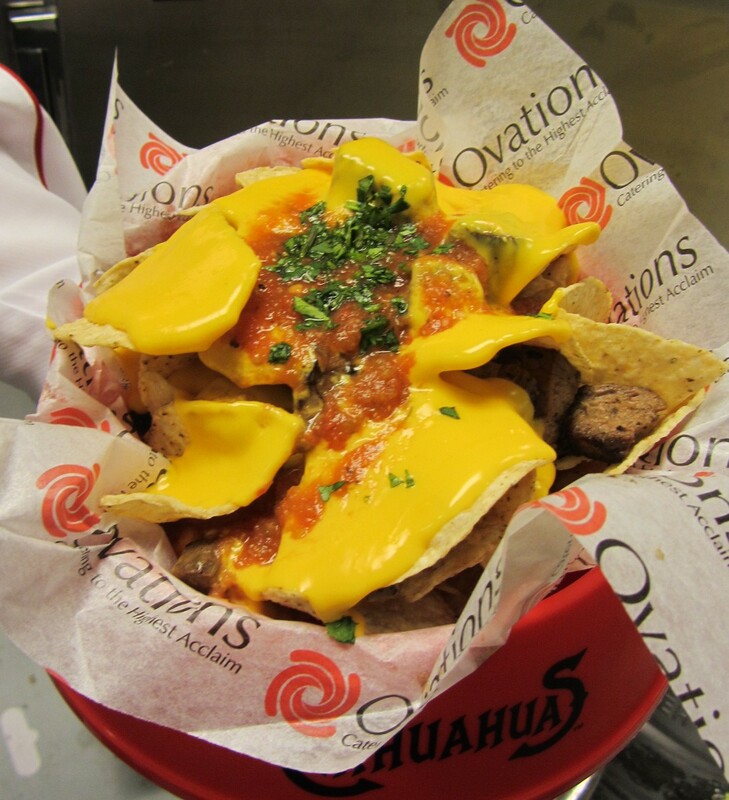 I learned this first-hand on April 29, the Chihuahuas second-ever home game, when Jeff Hanauer, general manager of Ovations food service at Southwest University Park, gave me a whirlwind tour of the team’s many concession offerings. 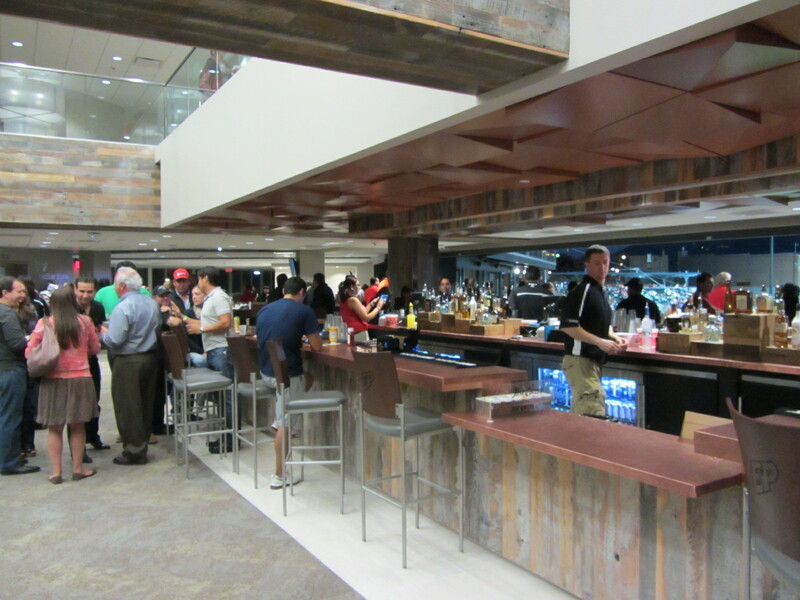 It’s all kind of a blur, but I’ll do my best to share with you what I remember…. 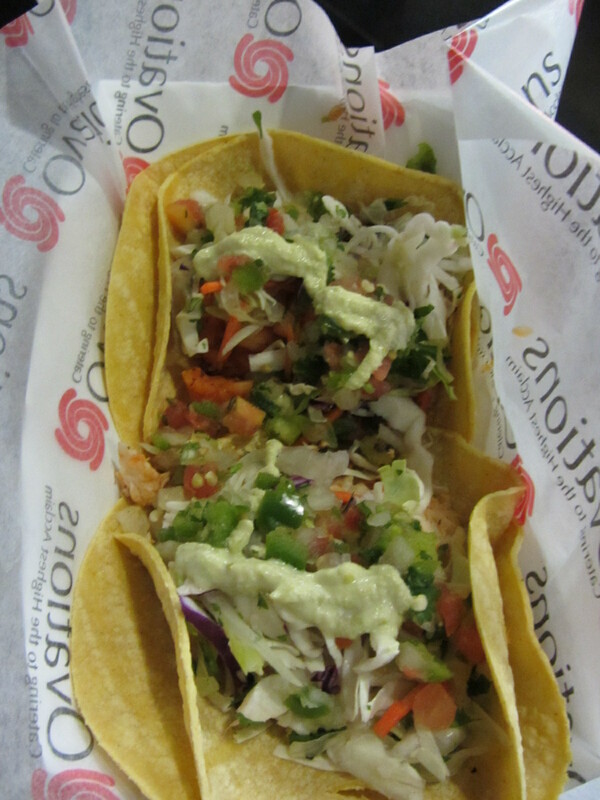 Prior to meeting up with Hanauer, I’d snapped a few stray food-related shots. 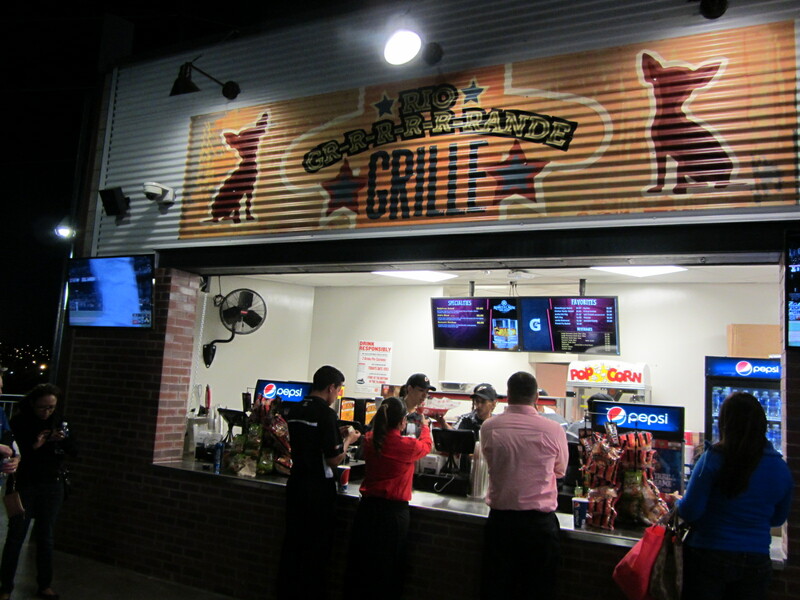 In keeping with the team’s “living the brand” philosophy, this concession stand is called the Rio Gr-r-r-r-r-rande Grill. 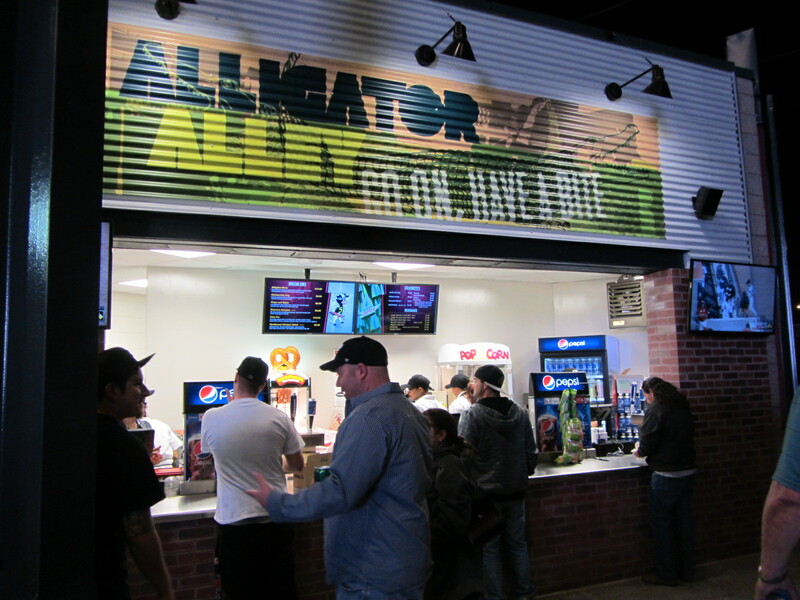 And this concession stand here isn’t a croc. 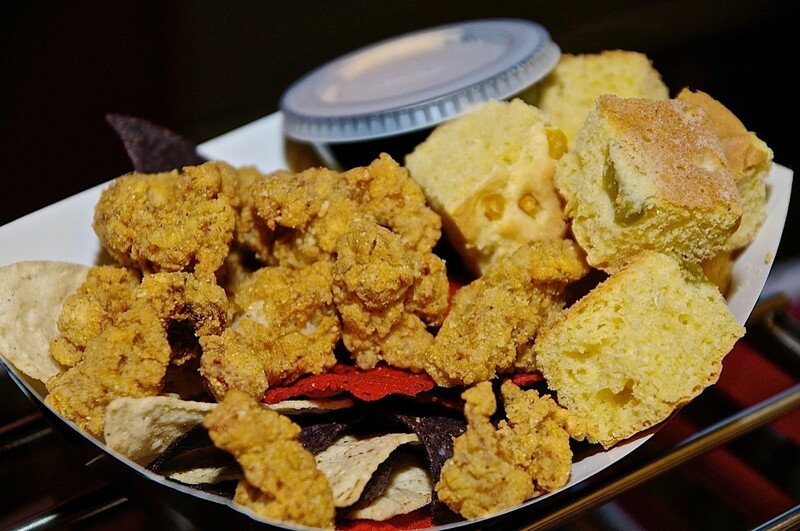 They actually sell alligator meat, deep-fried and bite-sized. And, look, the team has its own brand of snack food. 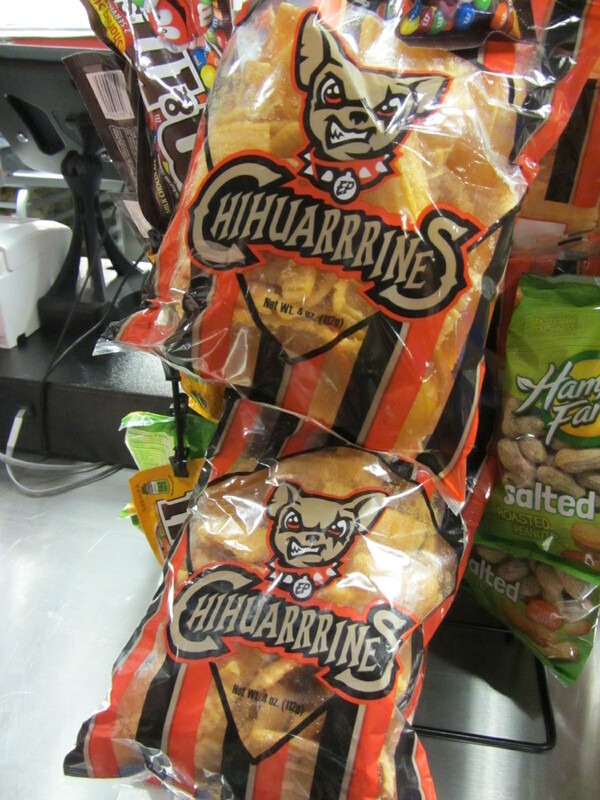 The thing to do with Chihuarrines is tear open the bag and douse with hot sauce (That’s what I was told, at least. The first ingredient was wheat flour, making it a no can do for a celiac such as myself). 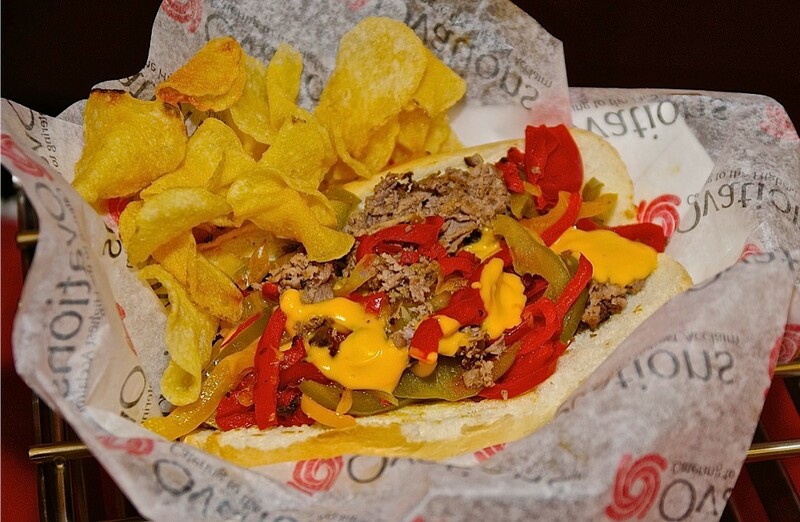 Pre-packaged snack food aside, the Chihuahuas have adopted an “everything’s fresh” concessions philosophy. 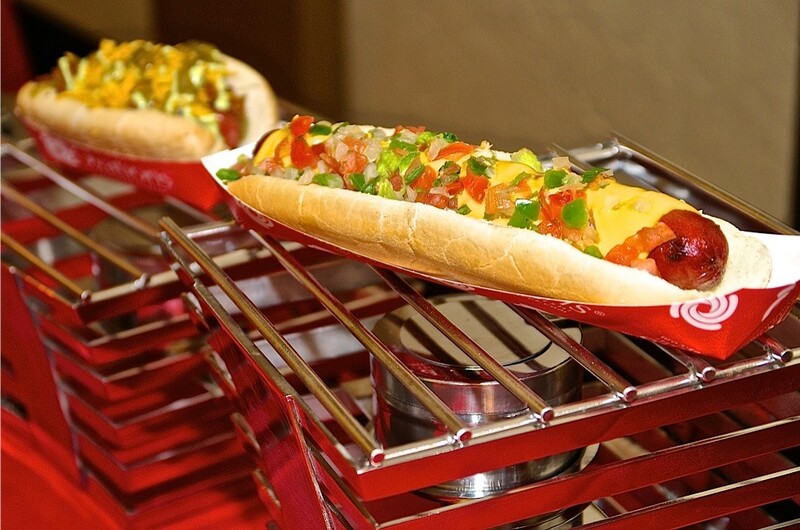 Items throughout the ballpark are made to order on the premises. 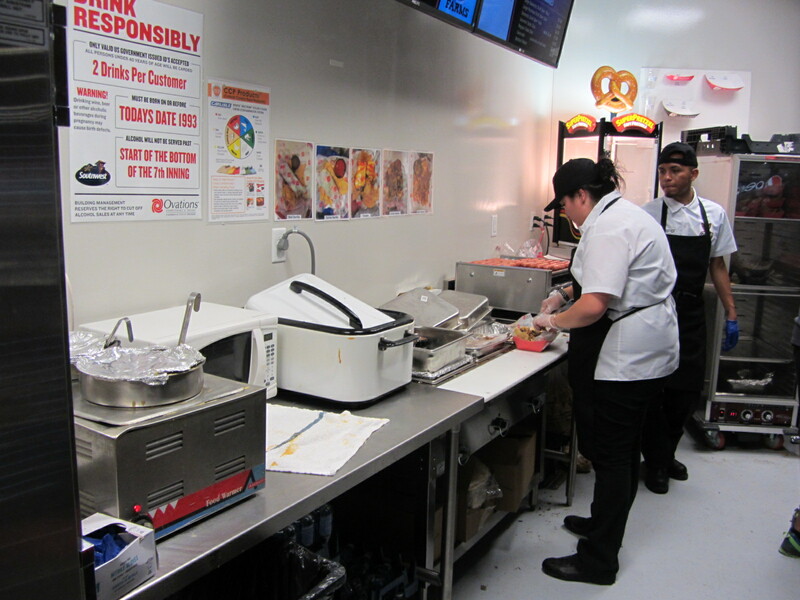 “You’ll never see a pre-wrapped hot dog here,” Hanauer told me. One shrimp, one tilapia. I preferred the shrimp. 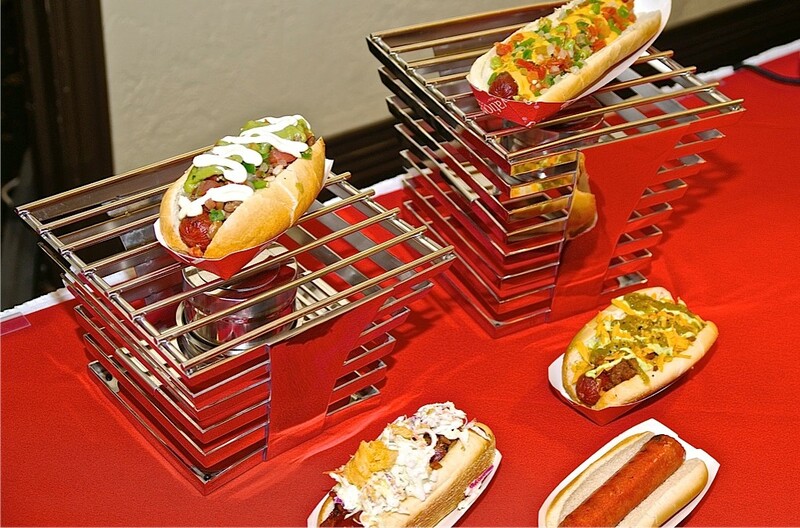 Hanauer told me that, in a market like El Paso, it would be foolhardy for the team to offer its own, quite possibly inauthentic, Mexican food. Why not just go straight to the source? 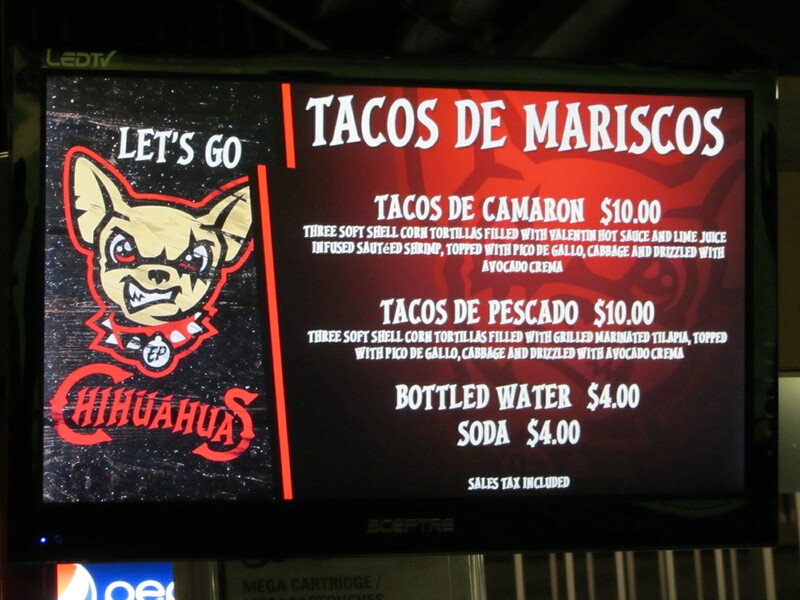 The Chihuahuas have therefore partnered with Leo’s, a famous restaurant with several locations in the area. 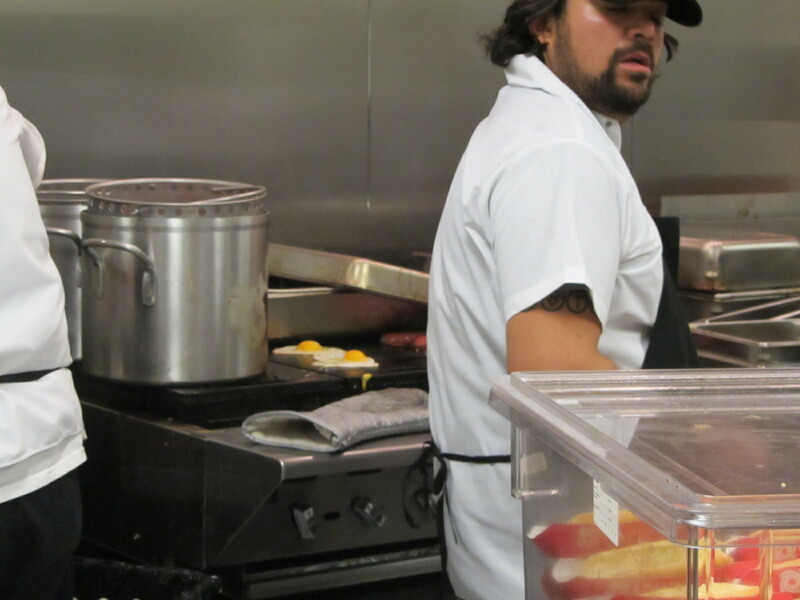 Here are the folks at Leo’s, doing their thing. 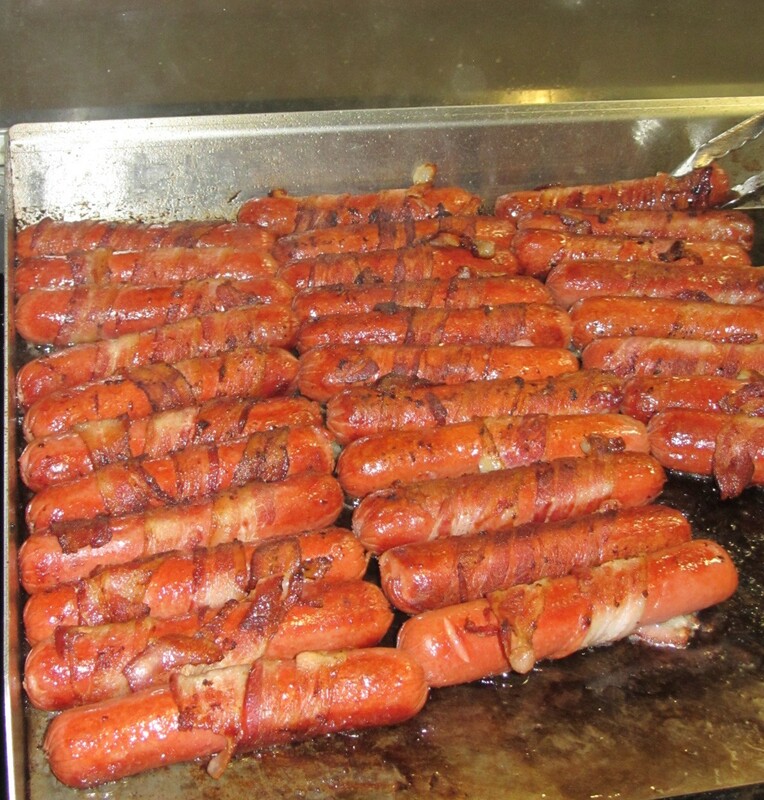 And that thing, in a word, is meat. Meat that has been cooked slowly throughout the day, for hours and hours and hours, so that by the time its served its exceedingly tender. 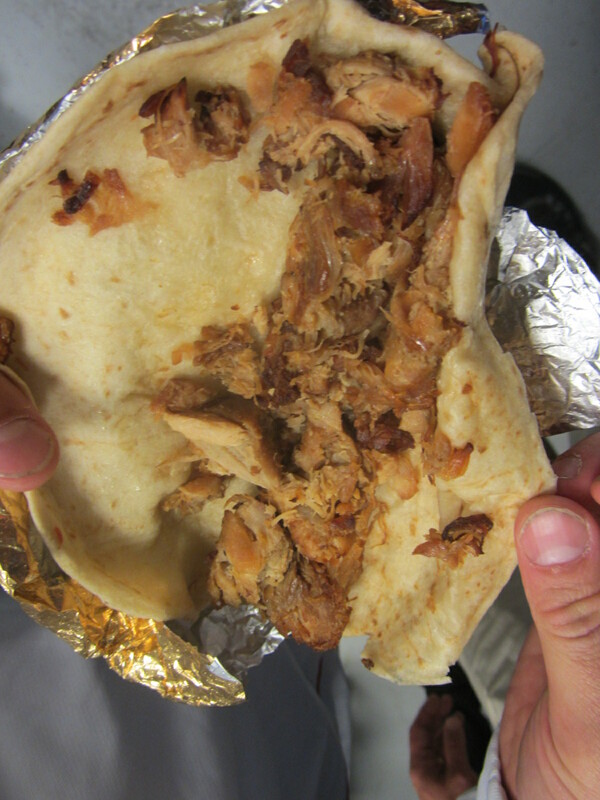 The burritos are minimalist affairs — maybe a little sauce is added, but its pretty much just meat. 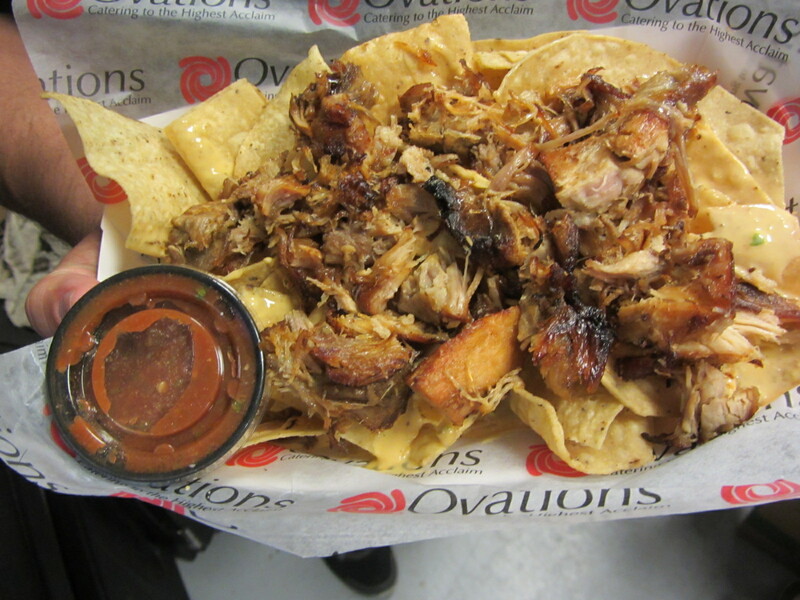 But these pork carnitas nachos were the star of the show, just amazingly good. The meat was so tender, yet crisp on the edges, and tasted amazing on its own along with the chips and queso. 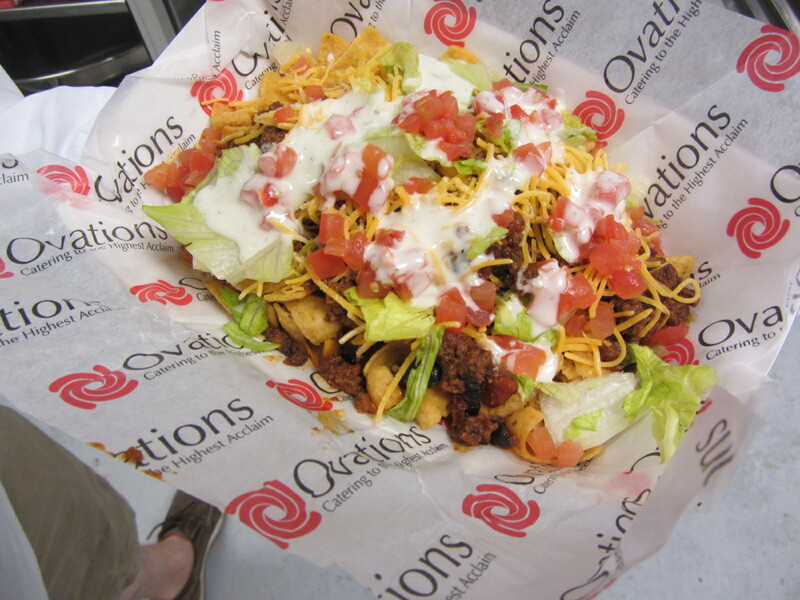 With all apologies to places in which I’ve had exemplary ballpark nachos (Memphis, Northwest Arkansas, Round Rock), these just might be the best. Hanauer, watching me tear into these things, mentioned that he didn’t think they were gluten-free (as in, the chips had wheat flour). I should have asked about this right off the bat, but when these things appeared in front of me that part of my brain went off. I just started eating as if there was no tomorrow. (And who knows? There might not be.) In this particular instance I am at peace with my transgression. These nachos were just that good. Anyhow, this is a picture of a margarita. Why is this significant? 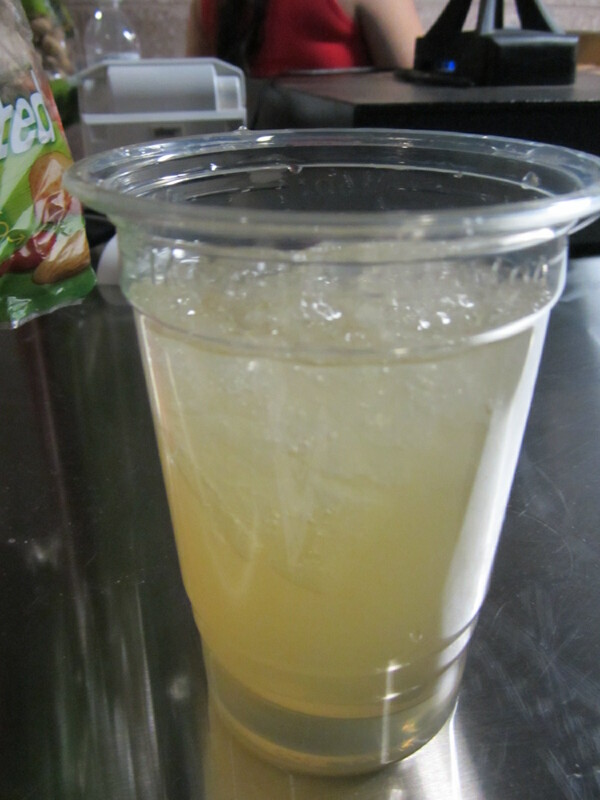 Because the margarita was prepared using the Bottoms Up dispenser, in which the cup fills from the bottom. Bottoms Up took the industry by storm a few years back, but I had never seen it used for anything other than beer. (Unfortunately, my video of the margarita being filled up was plagued by technical glitches, so this is just one more thing that you’ll have to trust me on). 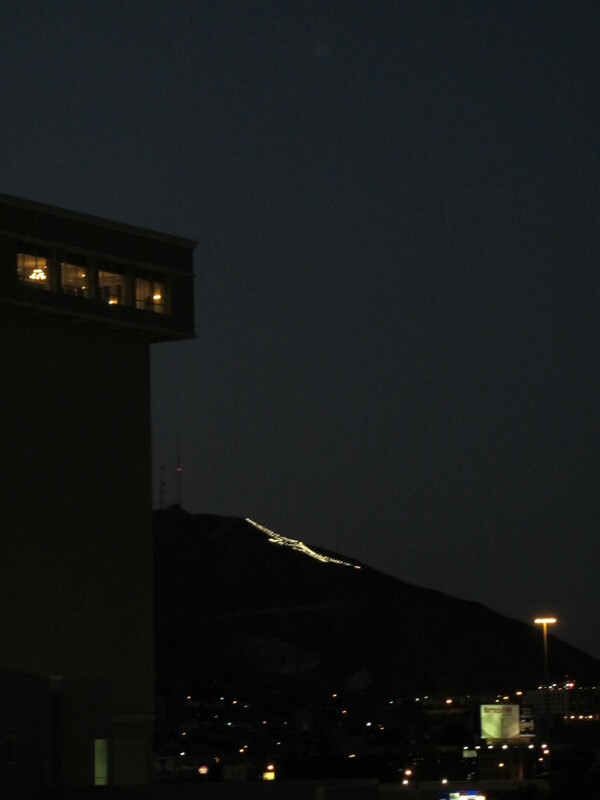 Speaking of technical glitches, this is one poorly lit photograph. 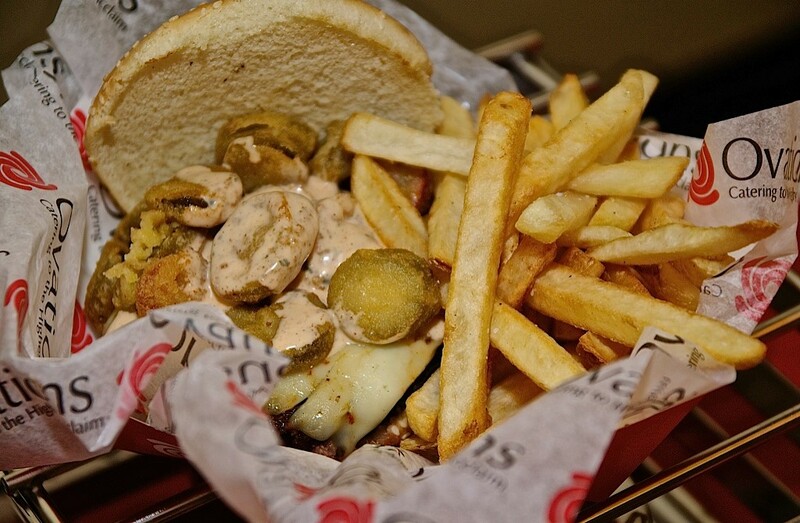 That there is the Flamethrower, a half-pound burger with ghost peppers, deep-fried jalapenos and jack cheese. Ghost peppers are the hottest peppers in the world, so they’re incorporated into the mix pretty sparingly — LEST SOMEONE DIES. 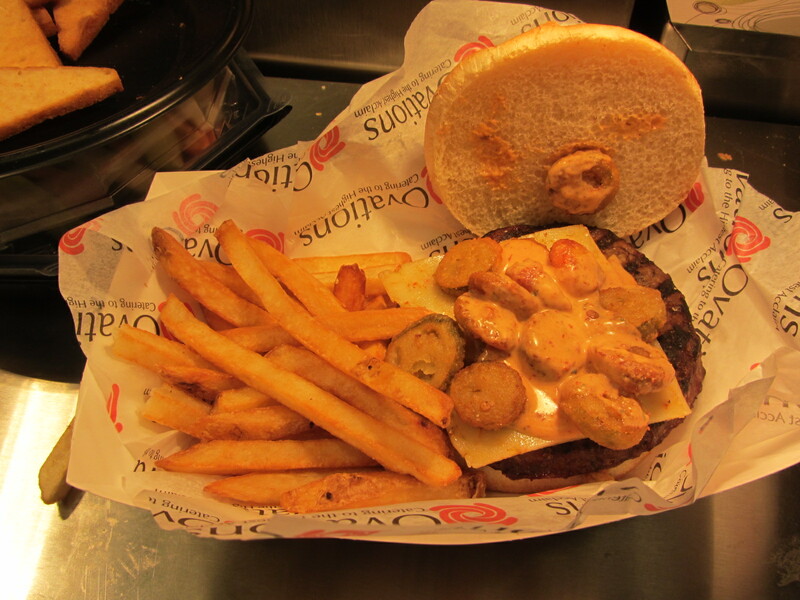 Still, this thing packs some serious heat and just might be the spiciest hamburger in Minor League Baseball. Tell me it isn’t. 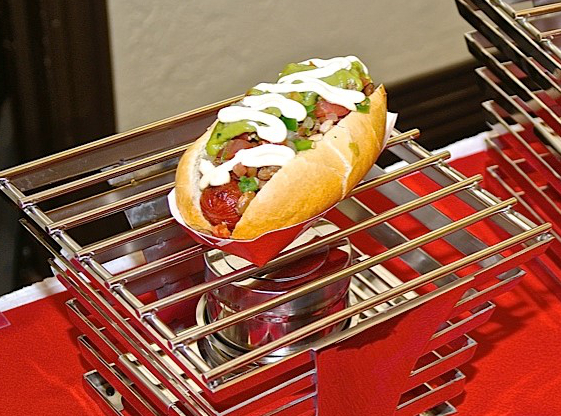 Here’s the Frito Pie, served up in a dog bowl. 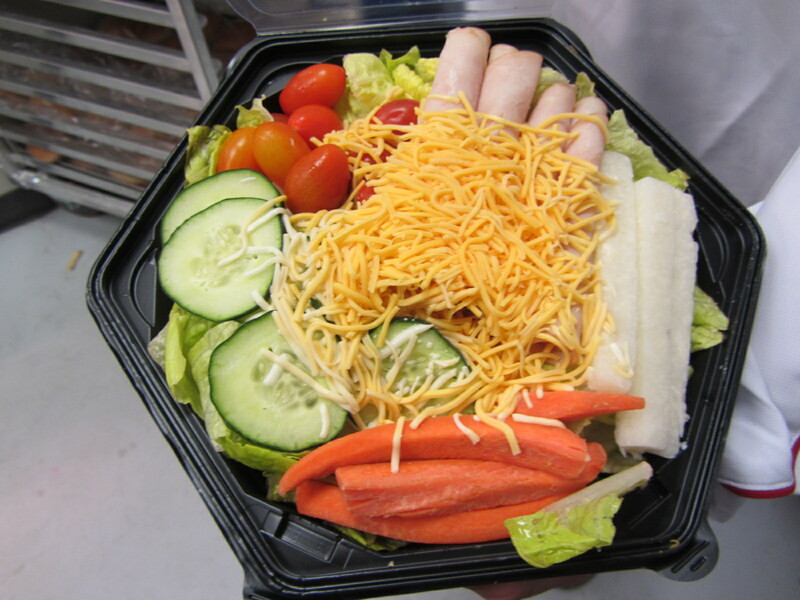 Absolutely fantastic, and gluten-free! I went at this one pretty hard for a minute. 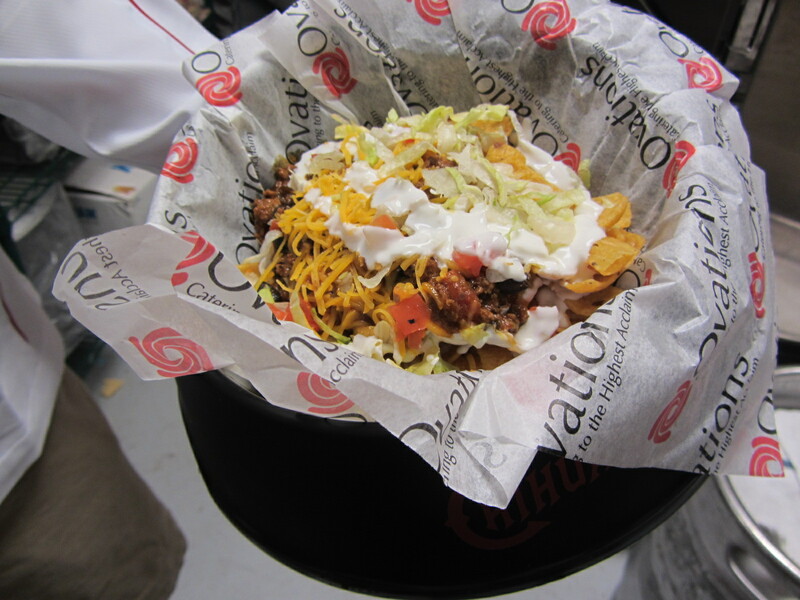 I’m not sure if the Frito Pie is always served in a dog bowl, but these steak nachos definitely are. 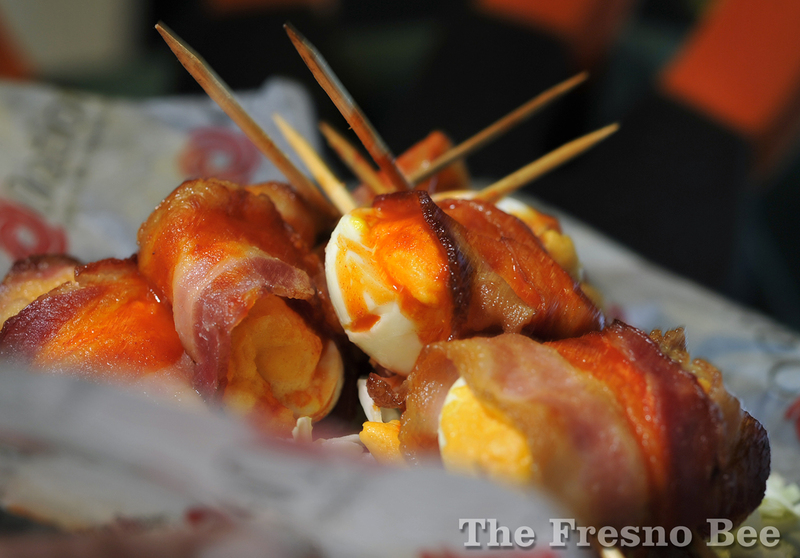 And these things did not skimp on the steak, as big tender chunks are distributed throughout. And — what’s this? 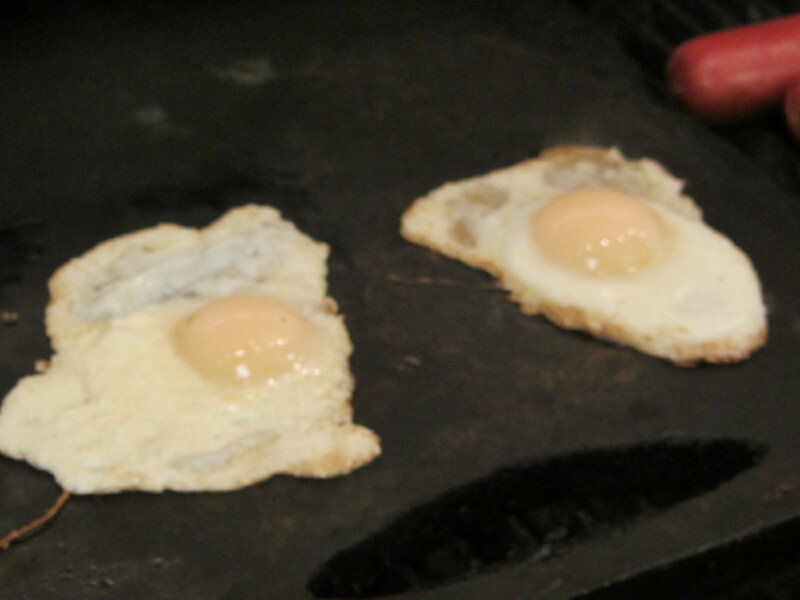 — eggs were on the grill. 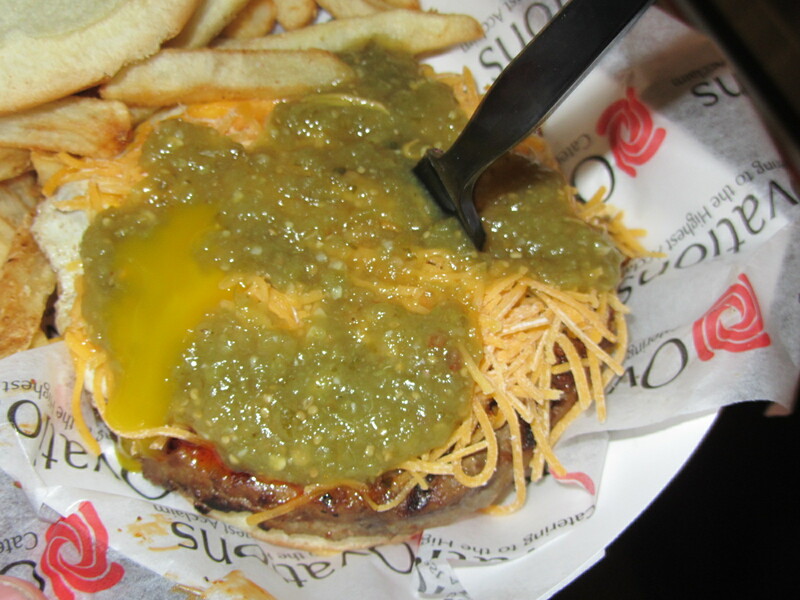 Eggs are a key component of the Huevos Rancheros burger, a variation of the Mexican breakfast staple. 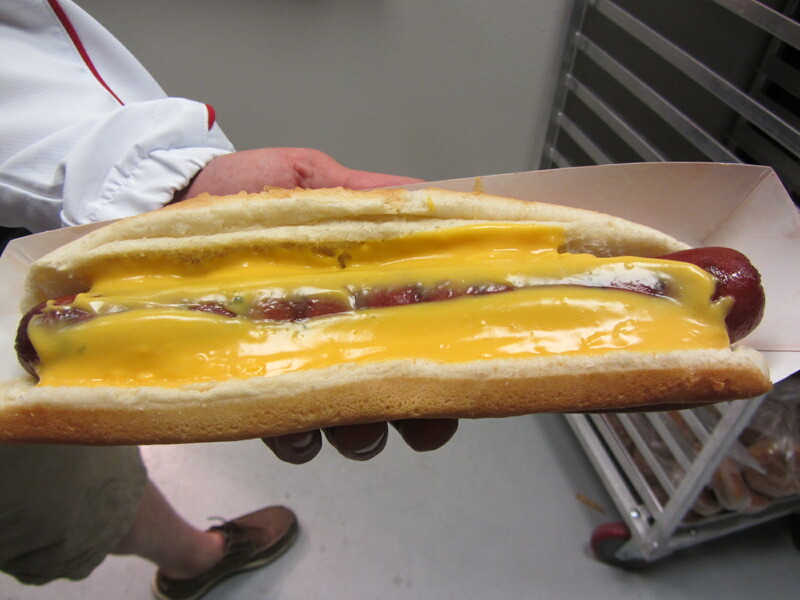 And then there was the Juarez dog, a variation of the Mexican street food classic. 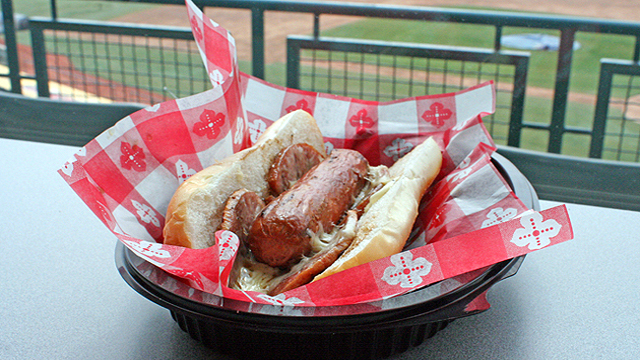 That is an applewood bacon-wrapped beef hot dog topped with pulled pork, BBQ sauce, cole slaw and chicharrones. 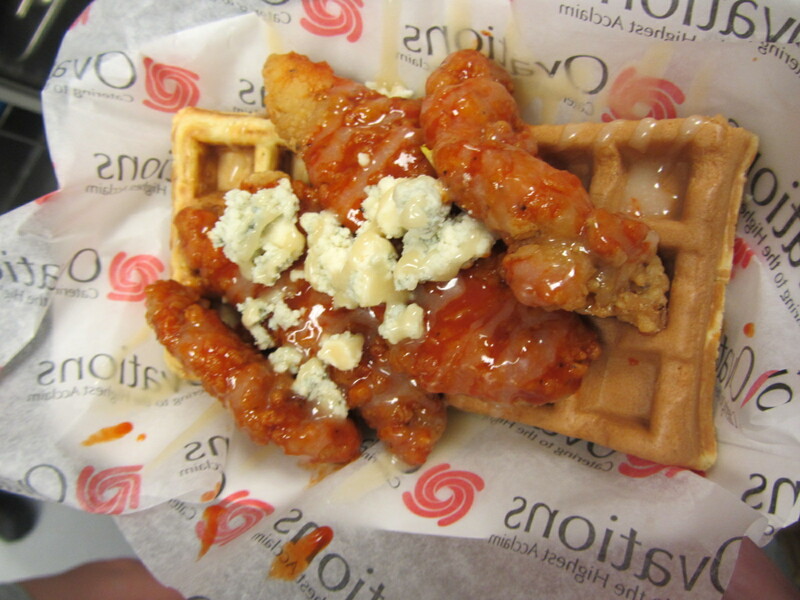 Think about that mix of flavors and textures for a second, it really is extraordinary. What’s this? 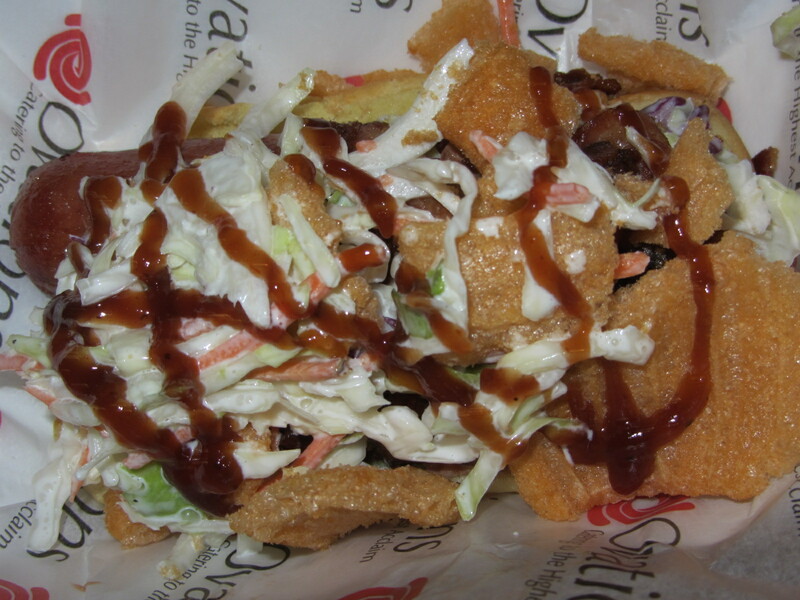 Another picture of a Frito Pie? Okay, cool, whatever. 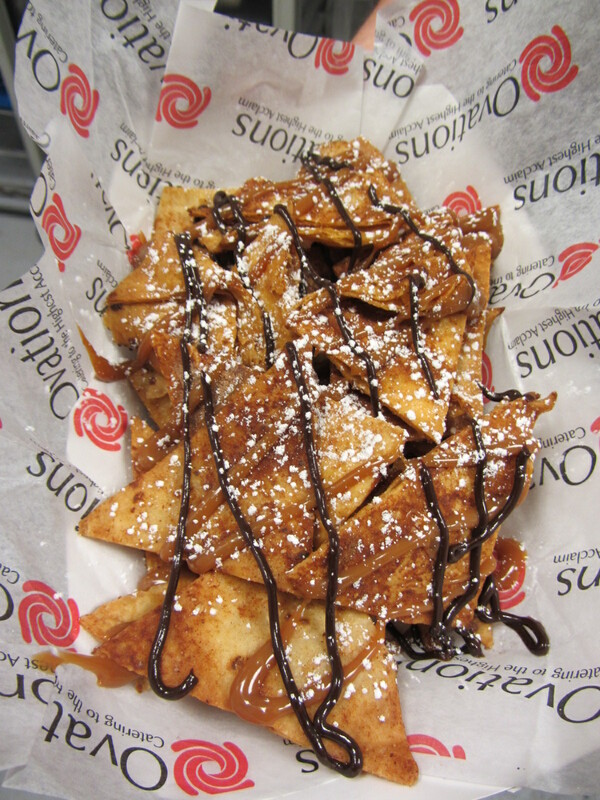 Dessert Nachos, because too much is never enough. 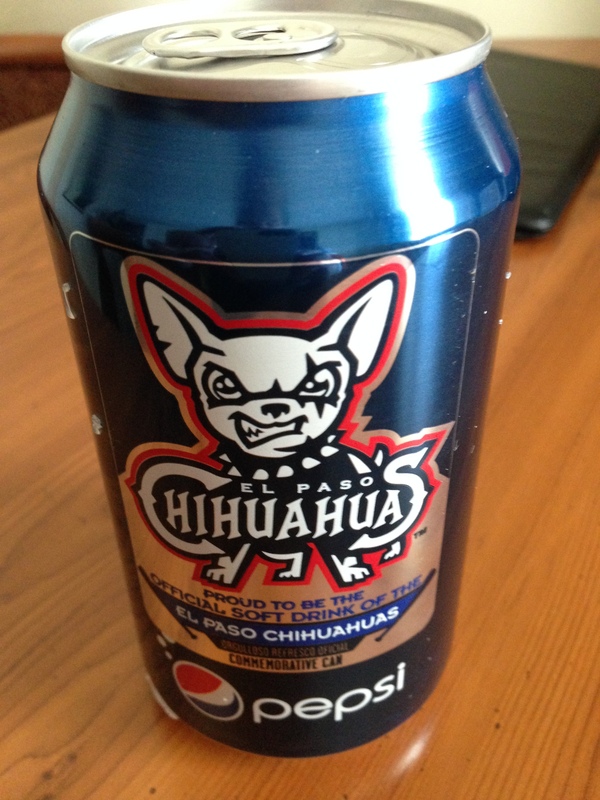 But speaking of dessert — the Chihuahuas offer what is now MY FAVORITE DESSERT IN ALL OF MINOR LEAGUE BASEBALL. 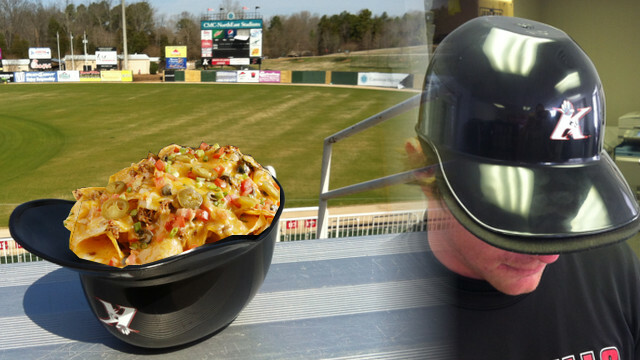 Here’s what I wrote over at MiLB.com: Quite simply the best dessert I’ve ever had at a Minor League ballpark. You could compare Raspas to a snow cone, but that would be like comparing Leo’s to Taco Bell. 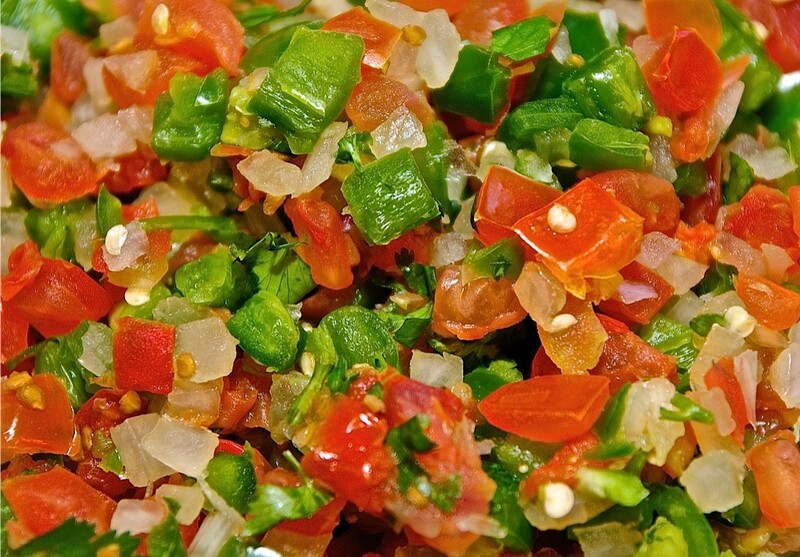 Shaved ice is topped with one of six fruit flavors, and a variety of condiments can be added to provide an additional kick of sweet, sour and/or spicy flavor. 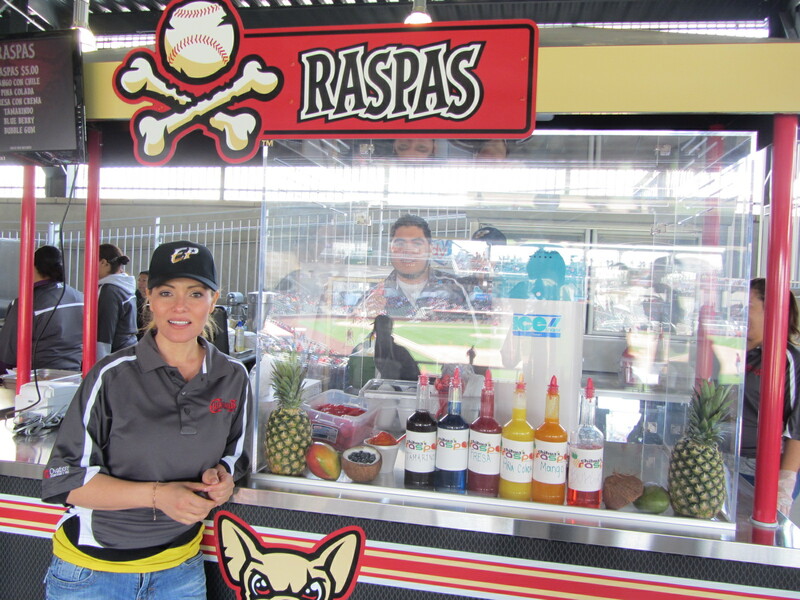 The Raspas stand is run by local concessionaire Elizabeth Triejo, who has a true passion for this traditional Mexican dessert. I stopped by the next day and got another one. 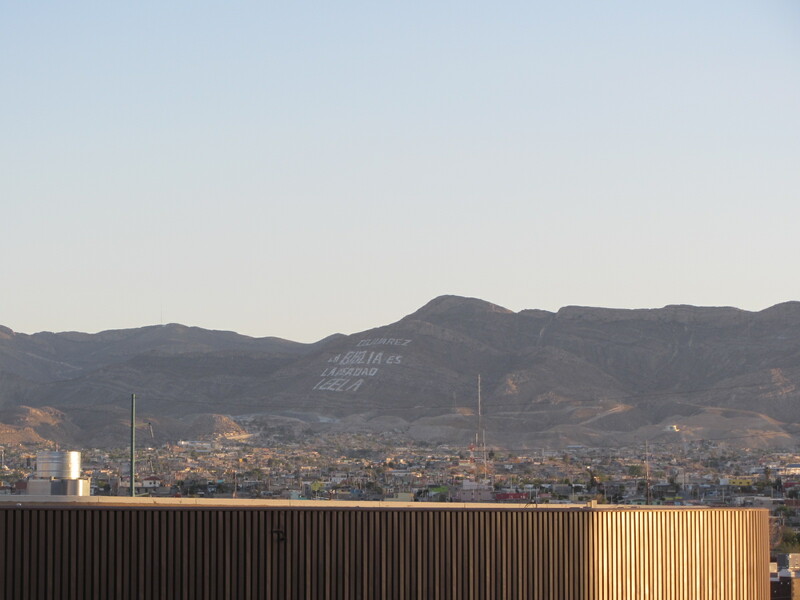 There are two key elements that make Raspas so good. One is that all of the fruit flavors are made in small batches by Elizabeth, so everything is all natural and tastes that way. 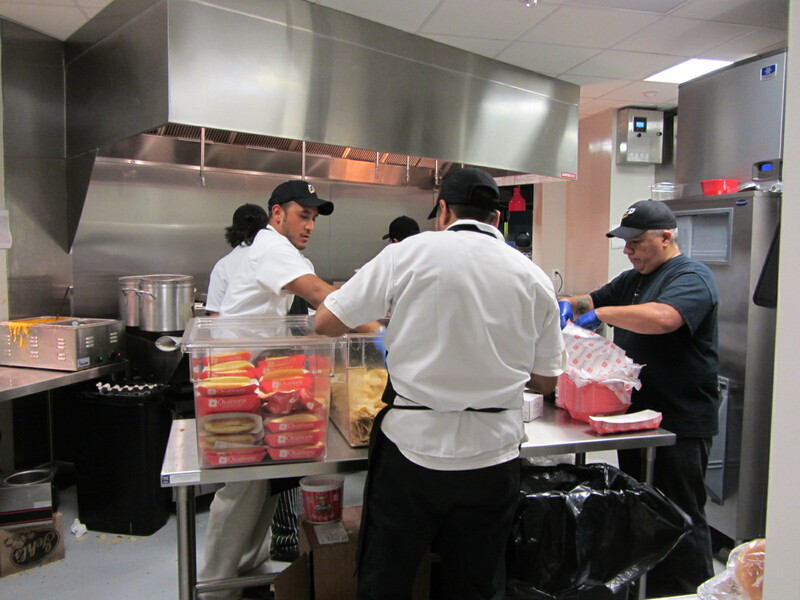 And then there are the condiments, such as Chamoy and Tajin, that deliver a customized mix of spicy, sweet and sour flavors. 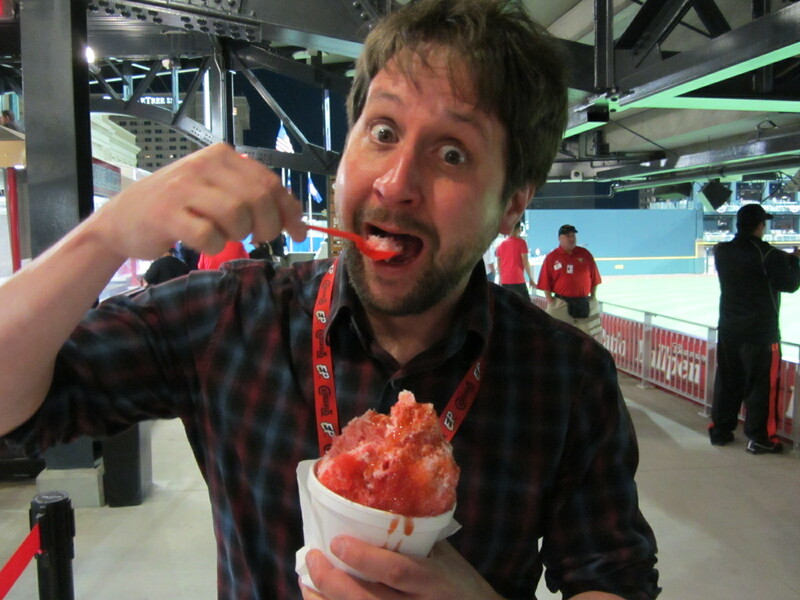 So, yeah, if you’re ever at an El Paso Chihuahuas game then get a raspa. My adjectival accolade abilities are failing me, but they are almost certainly better than any ballpark dessert you’ve had before. 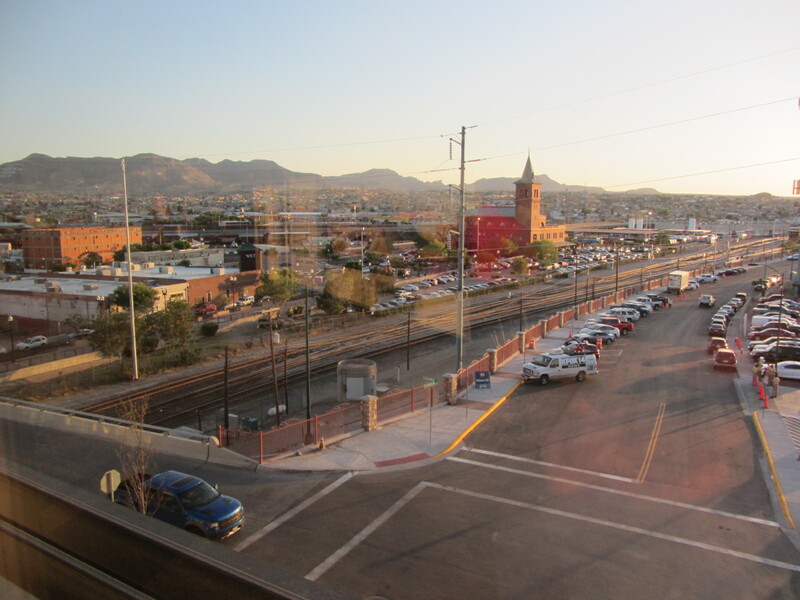 My itinerary on this particular road trip began in Albuquerque and ended in Austin, my primary motivation for traveling to this area in the first place was so that I could visit El Paso. 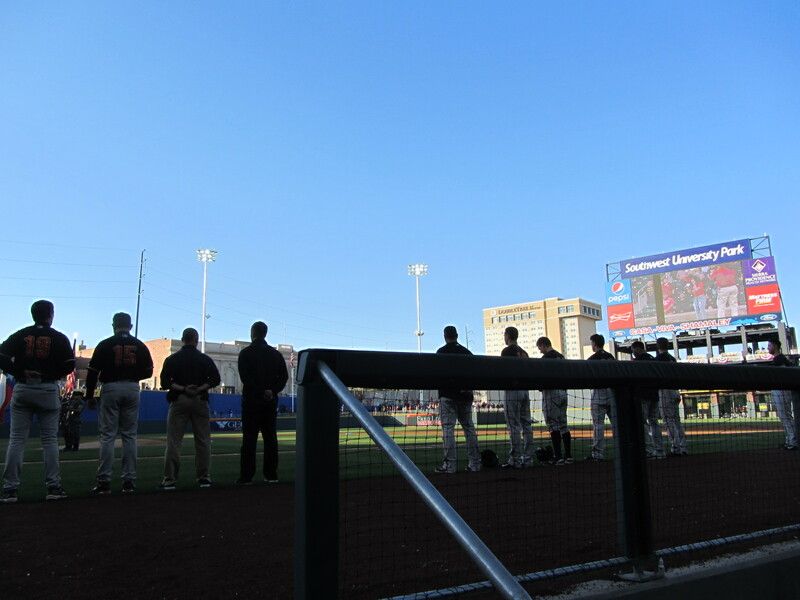 For it is in El Paso that one will find the biggest story of the 2014 Minor League season, the El Paso Chihuahuas. 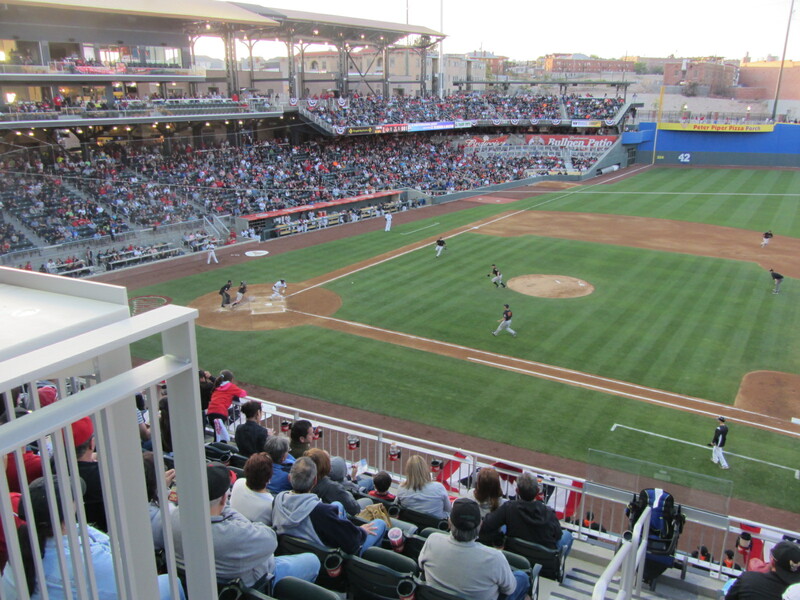 This Pacific Coast League entity played its first-ever home game on April 28 (after opening the season in their old home of Tucson), but I spent that evening in Albuquerque. 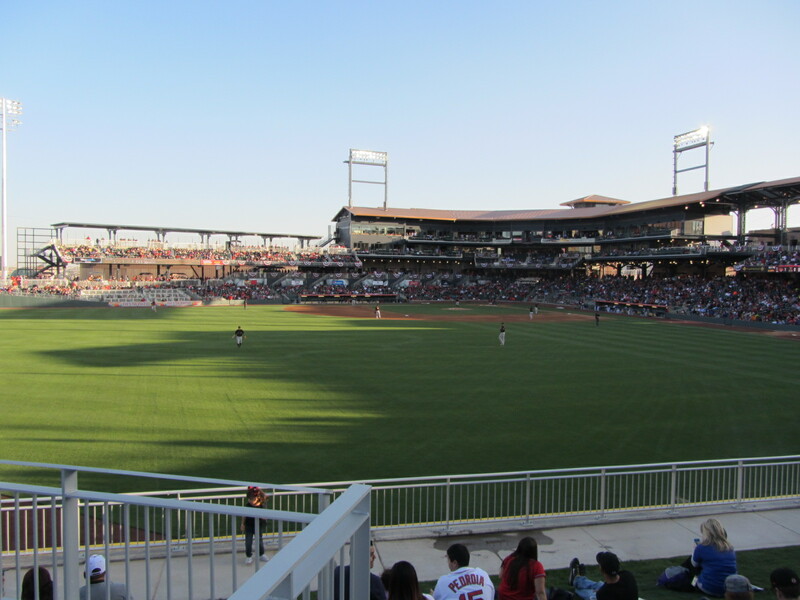 I was on hand for the second-ever Chihuahuas game, however, as on April 29 I arrived in the city and quickly made my way to Southwest University Park in order to see what all the fuss was about. 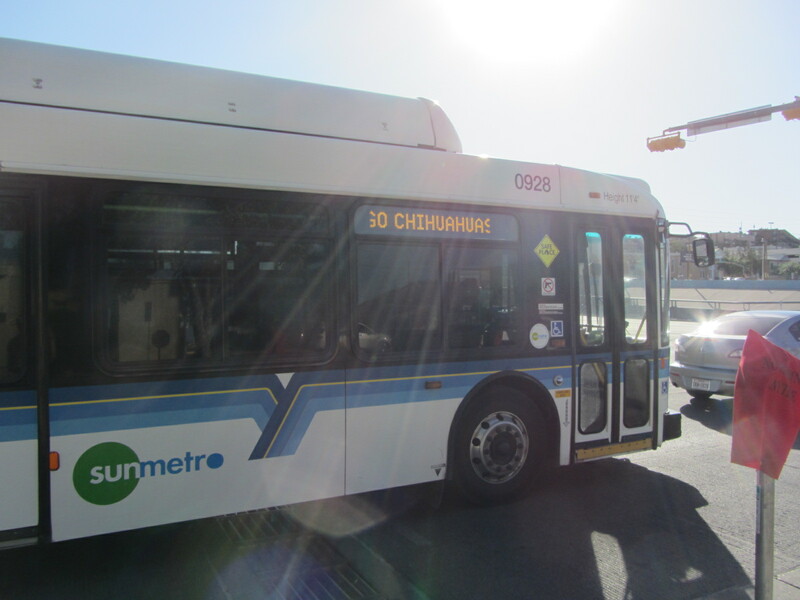 En route to the stadium, public transit showed its support. 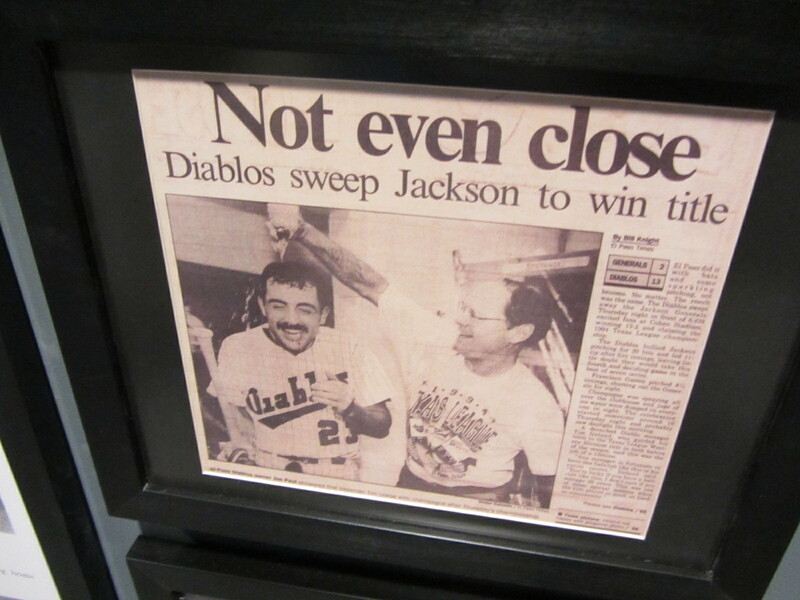 The newspaper coverage during the days that I was in town was extremely enthusiastic. 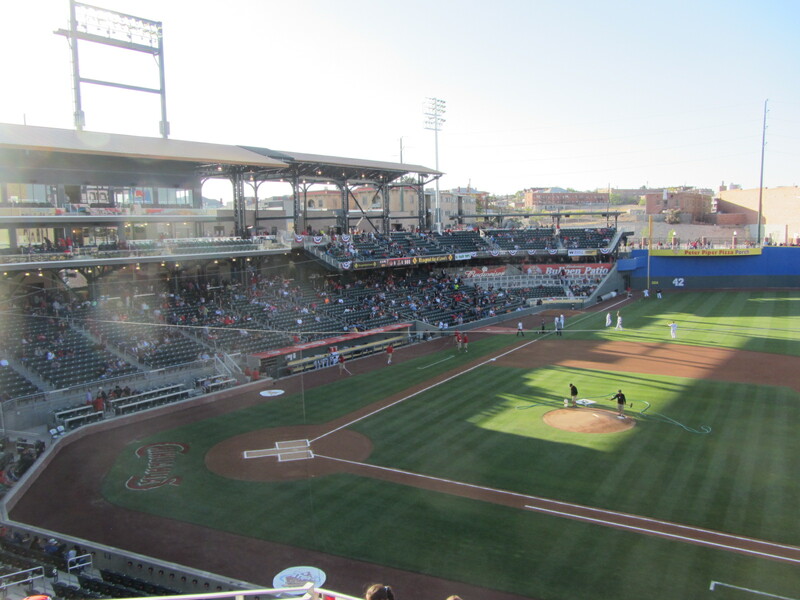 And the one time I turned on the radio while driving in El Paso, I happened to hear a morning talk show in which one of the co-hosts was being lambasted for wearing a Chihuahuas hat after having initially bashed the team name and all it stood for. 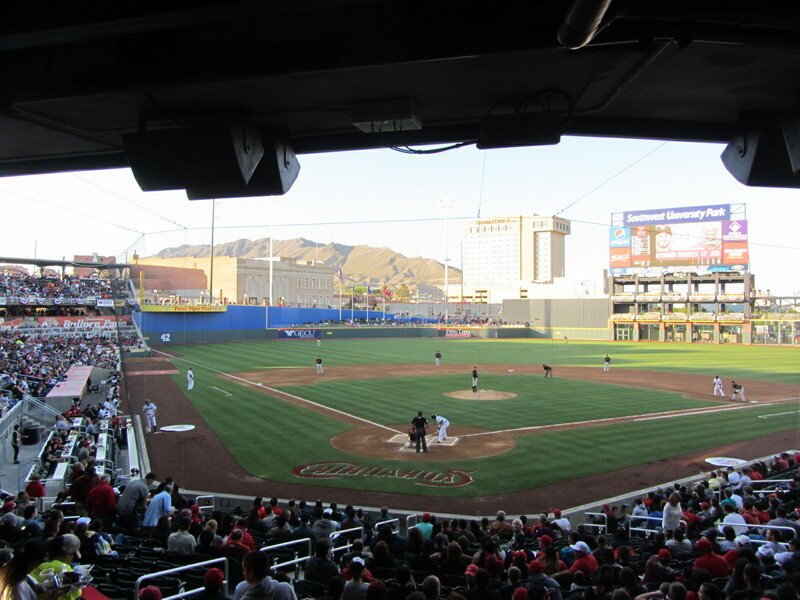 In short, the Chihuahuas aren’t just the biggest sports story in El Paso, they’re the biggest story in El Paso. Period. 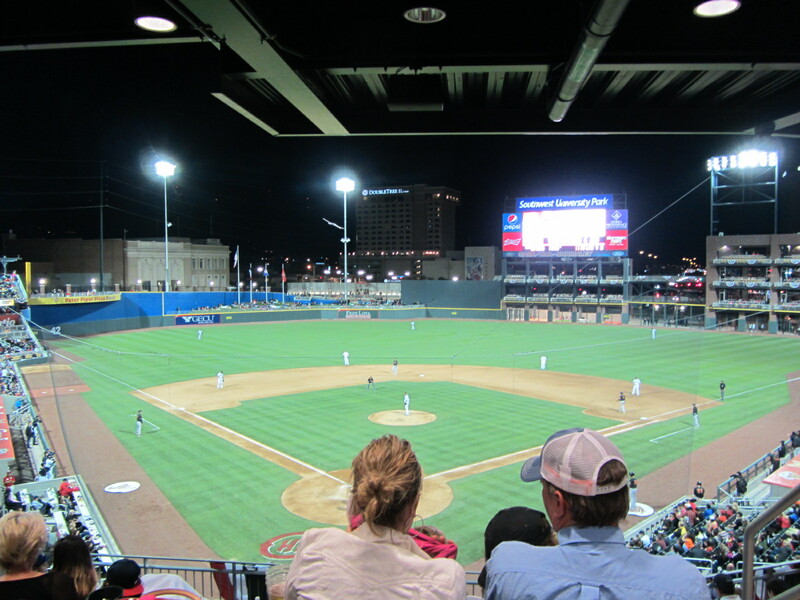 I have already written a long MiLB.com story about the Chihuahuas and their home of Southwest University Park, which provides far more context regarding how and why the team came to be. 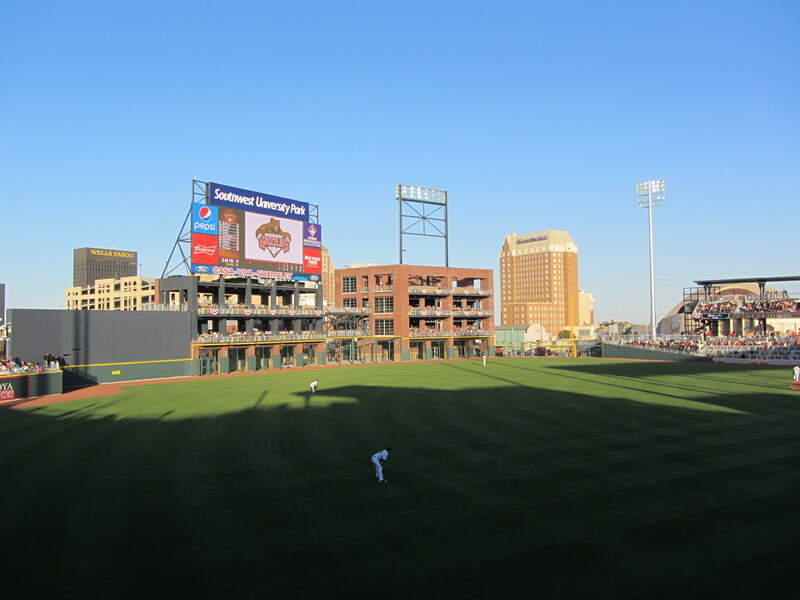 The Chihuahuas are going to be an interesting team to follow for quite some time, on several levels, but this post is gonna keep it simple. 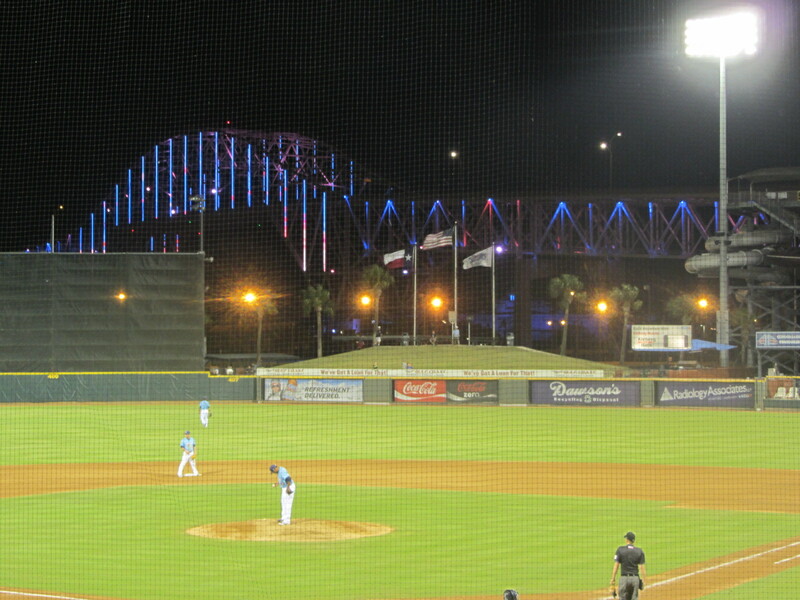 This post will simply walk you through (a portion of) my night at the park. 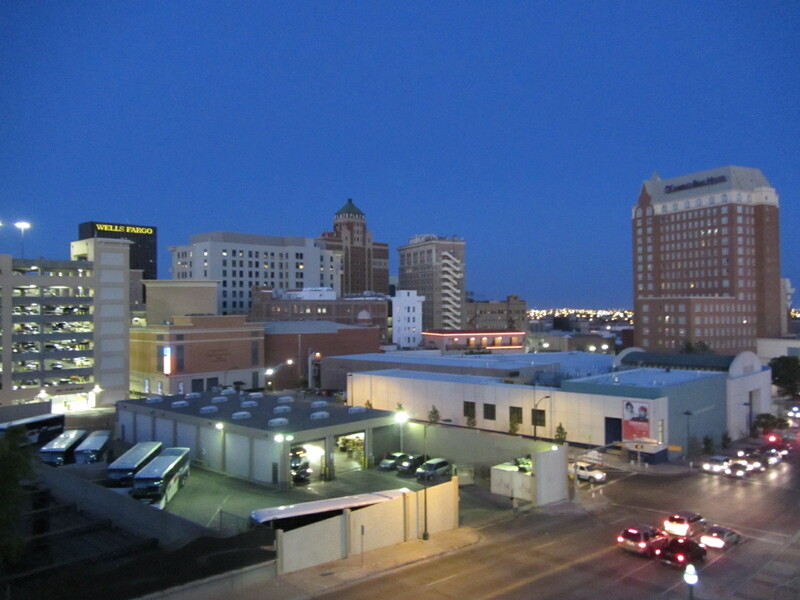 My hotel, a Holiday Inn, was on Missouri Avenue in downtown El Paso. 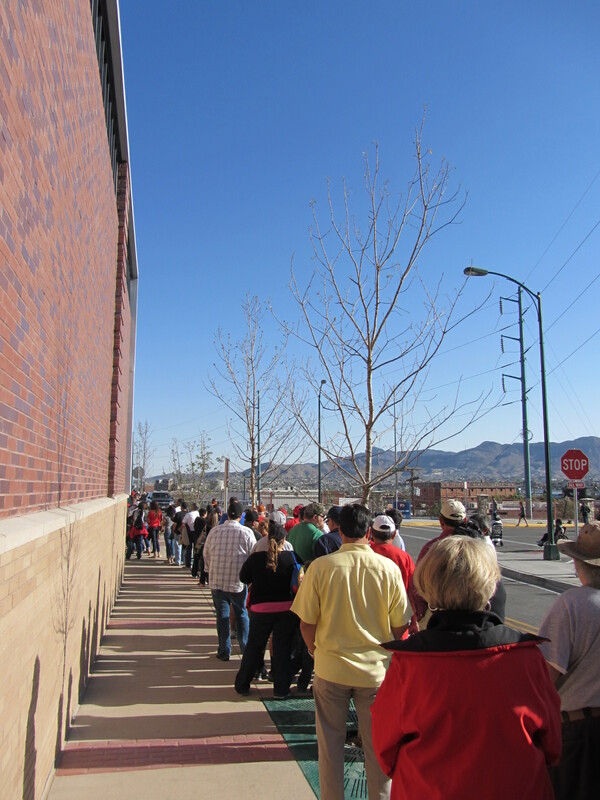 From there it was just a short walk to the stadium. 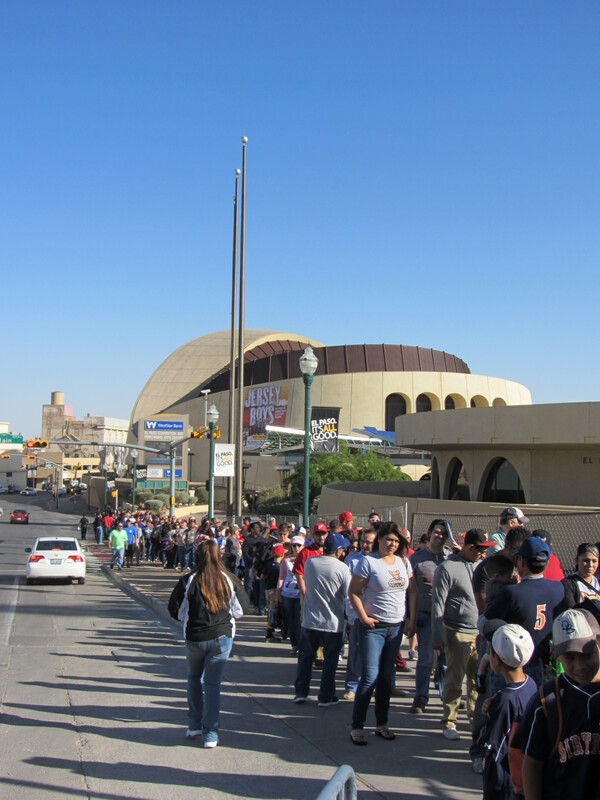 Getting closer, as the ballpark can be seen just beyond the El Paso Museum of History. And then — bam! 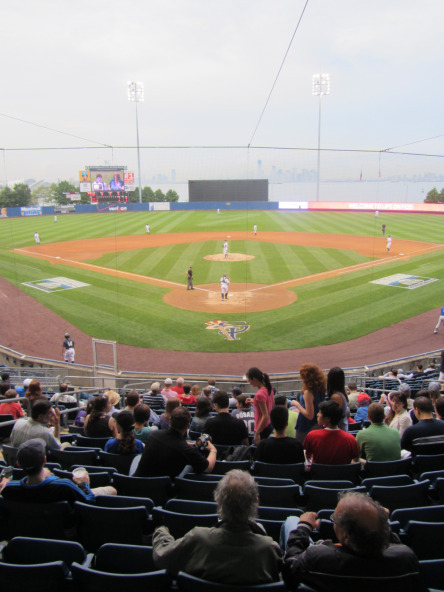 — the ballpark. 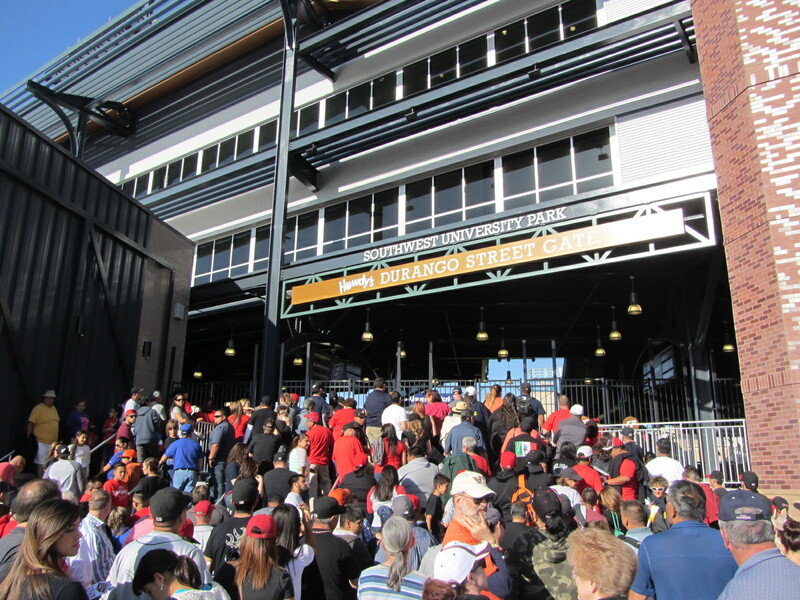 The gates hadn’t yet opened at the time I arrived, but anticipation was high. 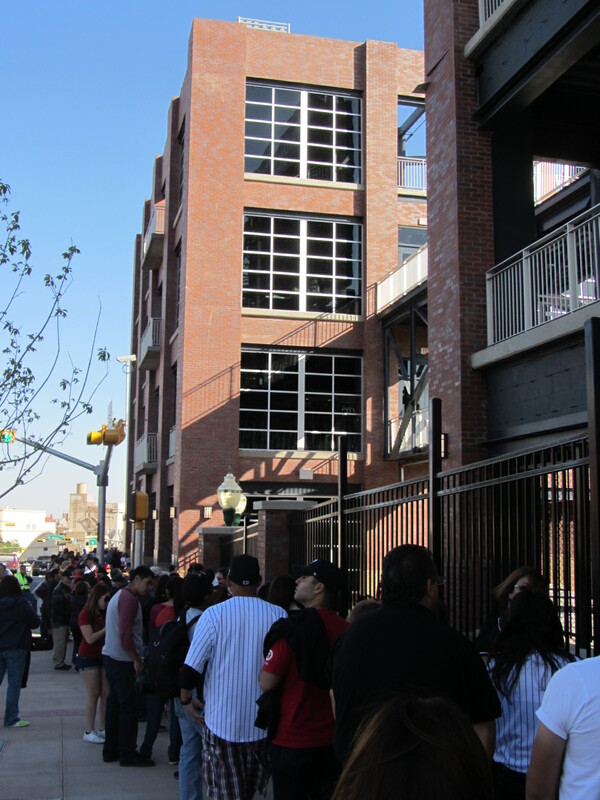 People were lined up on all sides of the ballpark, hundreds deep. 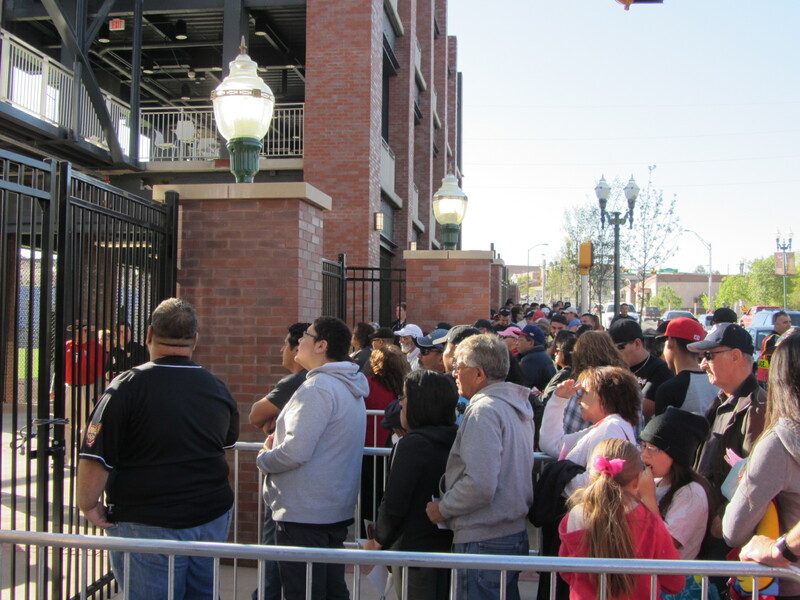 I had never seen so many people waiting to get into a Minor League stadium, ever. 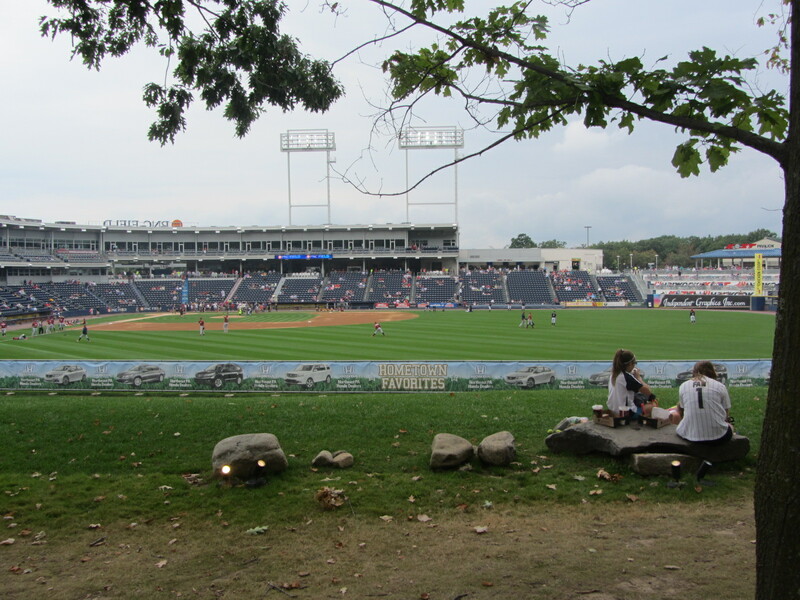 Once I got inside, I took this photo of the field itself. 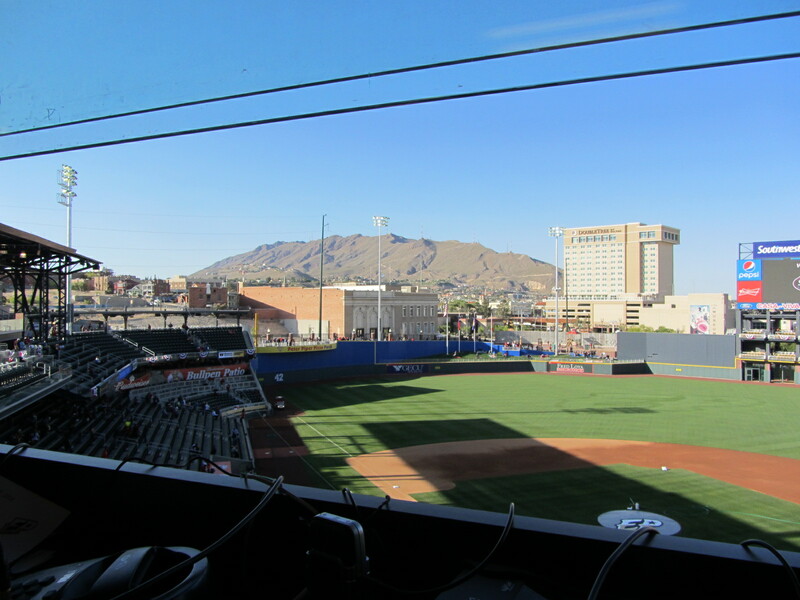 Those are the Franklin Mountains looming beyond left-center field, and later on during my stay I learned that the Rocky Mountains extend to El Paso as well. 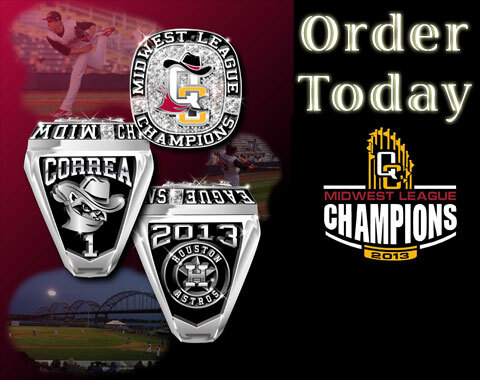 Taking a cue from the Lake Elsinore Storm, the Chihuahuas’ logo features a prominent set of eyes. 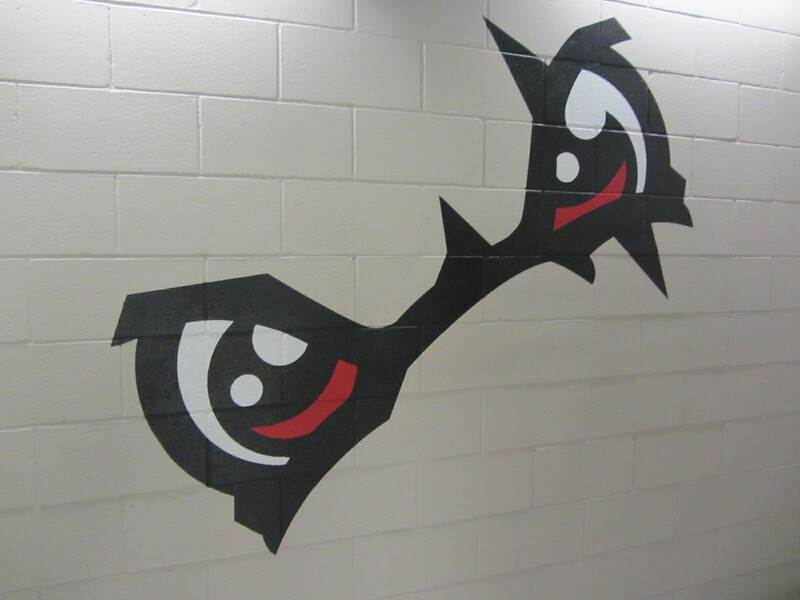 Here’s an eyes-olated view, which I snapped on the staircase. 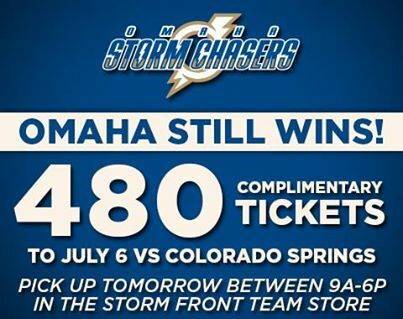 Quite unexpectedly, just prior to the game I received an invite to throw out a ceremonial first pitch. 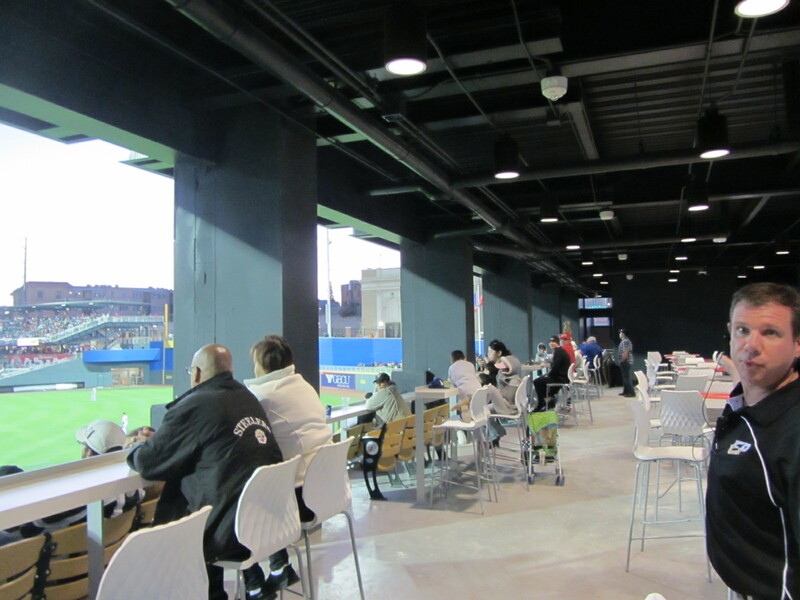 While this was the second game of the season, there was still an Opening Day-level of excitement. 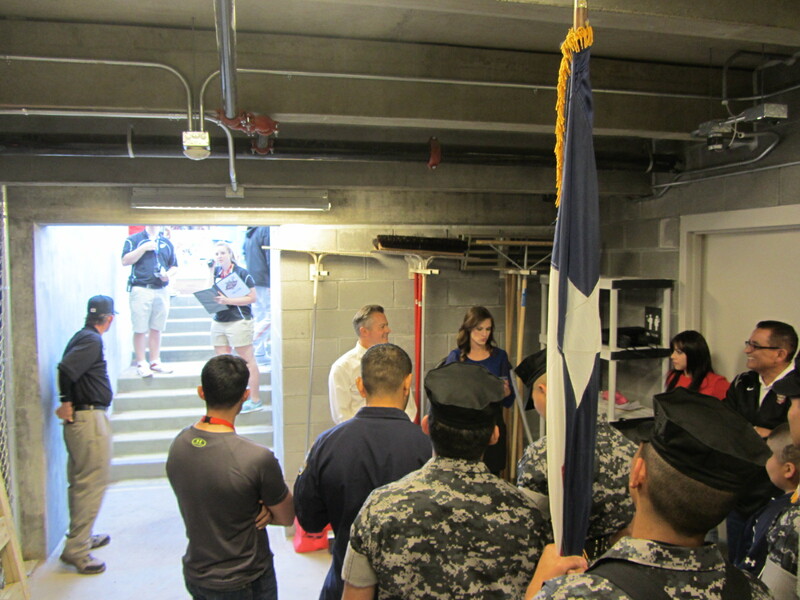 Politicians, media personalities, pop singers, youth baseball players and military members were all gathered in this little “room” adjacent to the visitor’s dugout. 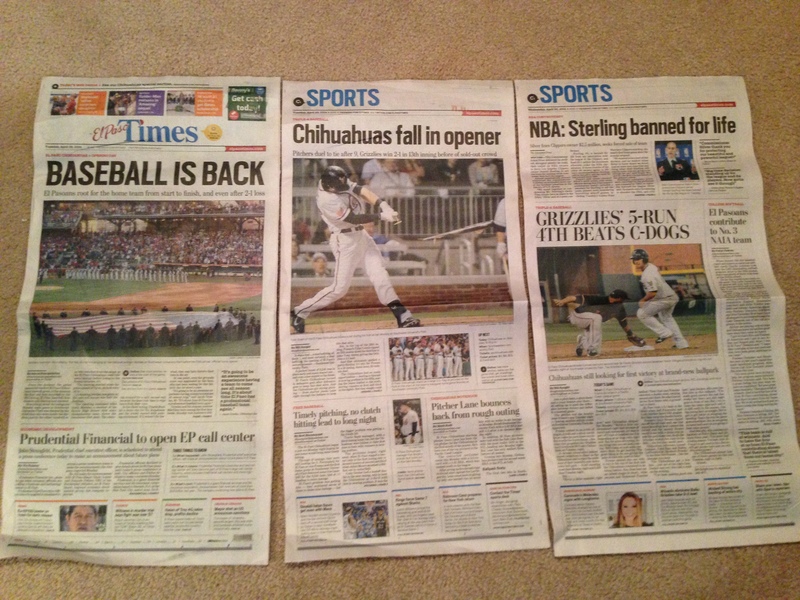 Being from out of town, I kind of felt like an interloper amid this display of local pride. 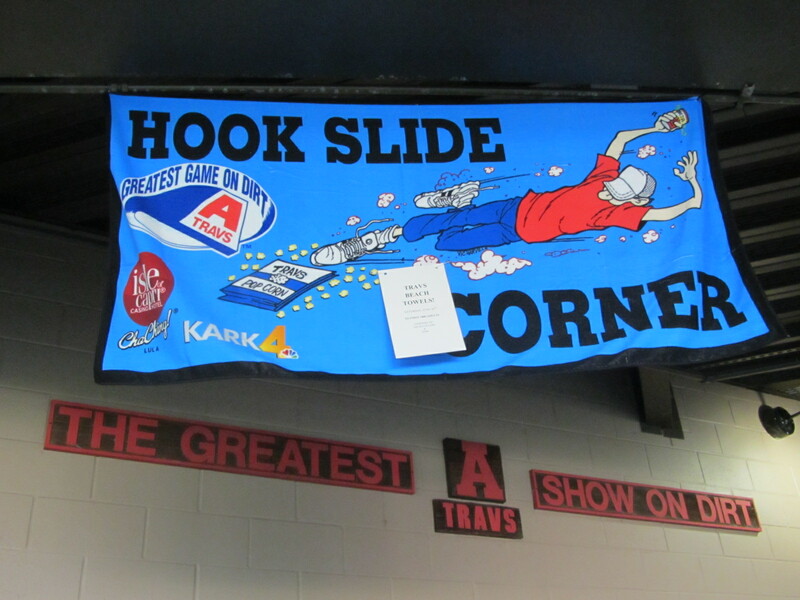 As for my first pitch — it was a strike, but no evidence seems to exist. Or, if there is evidence, I don’t have it. Hey, does anybody out there have any evidence? Chico? I know you can hear me, Chico! Don’t walk away from me! 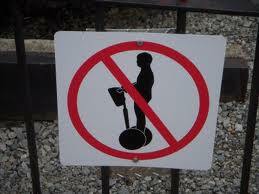 Eh, nevermind. I have no idea what I’m talking about anyway. 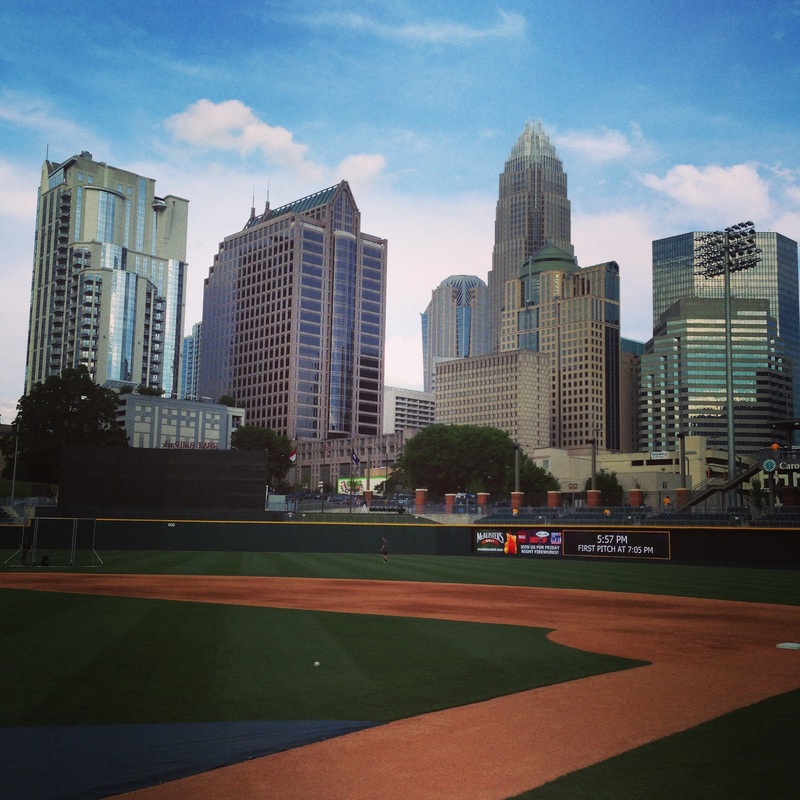 After throwing my first pitch, I returned to the concourse and embarked on a solo walk around the facility. 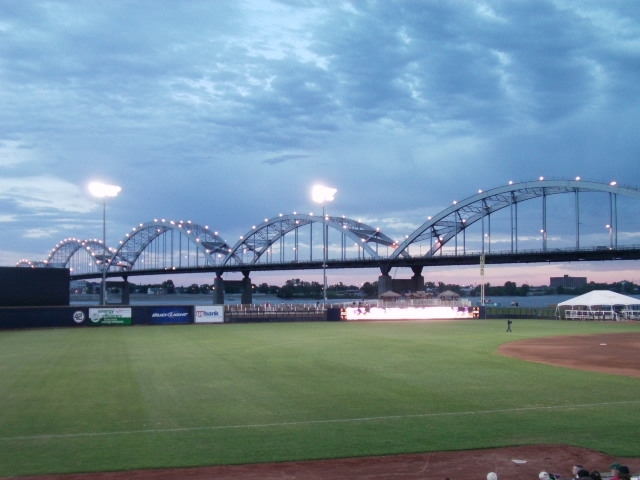 A pictorial tour, or, as I like to call it, a pic-tour-ial, will now commence. 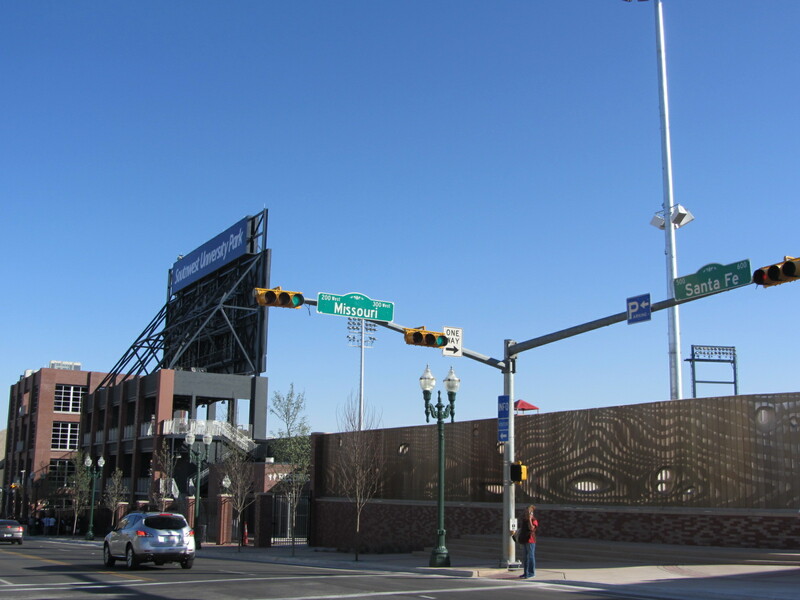 See that brick structure out in right field? Keep that in mind, we’ll visit that later. 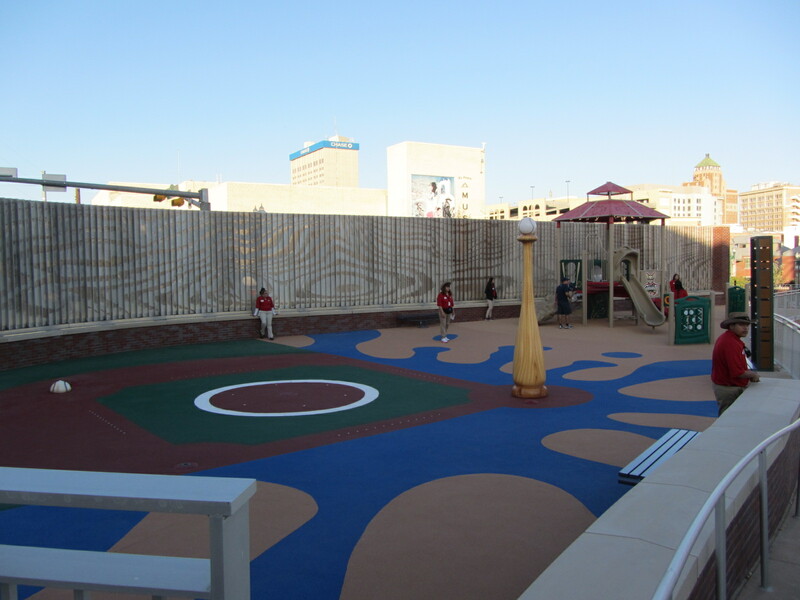 The Splash Zone, which remained splashless on this pleasant Spring evening. 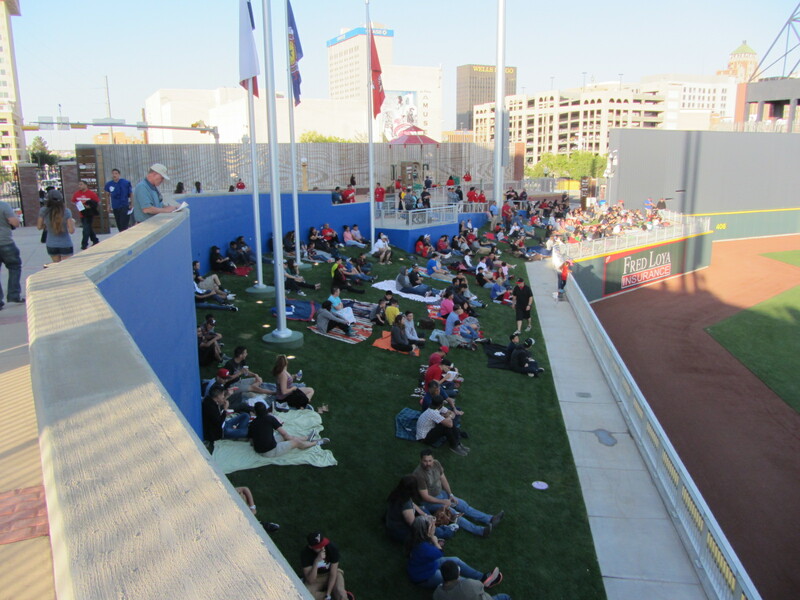 The Chihuahuas bullpen is ensconced in a little alcove located down the third base line, while the visitor’s are caged within the bottom floor of this outfield structure. 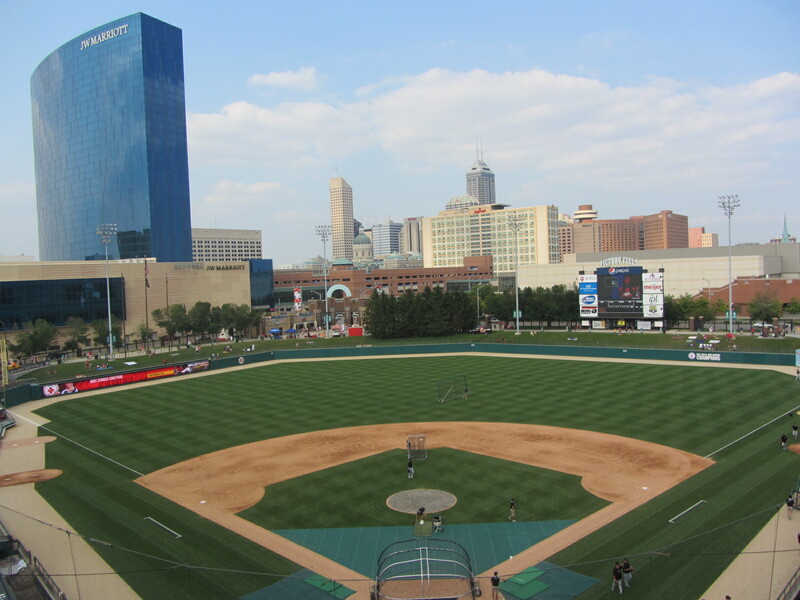 And now here we are back behind home plate, somehow. I’m not sure how it happened either. 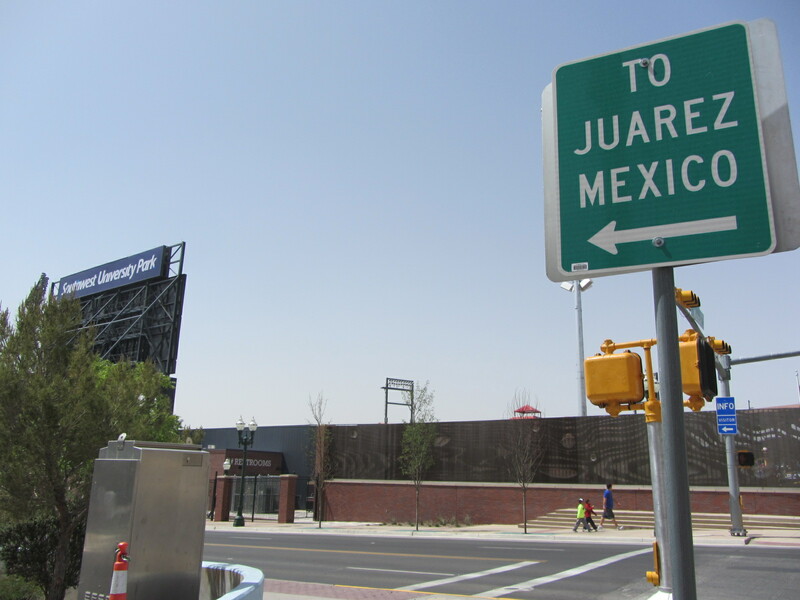 As I mentioned previously, the Mexican city of Juarez is located directly behind the ballpark. 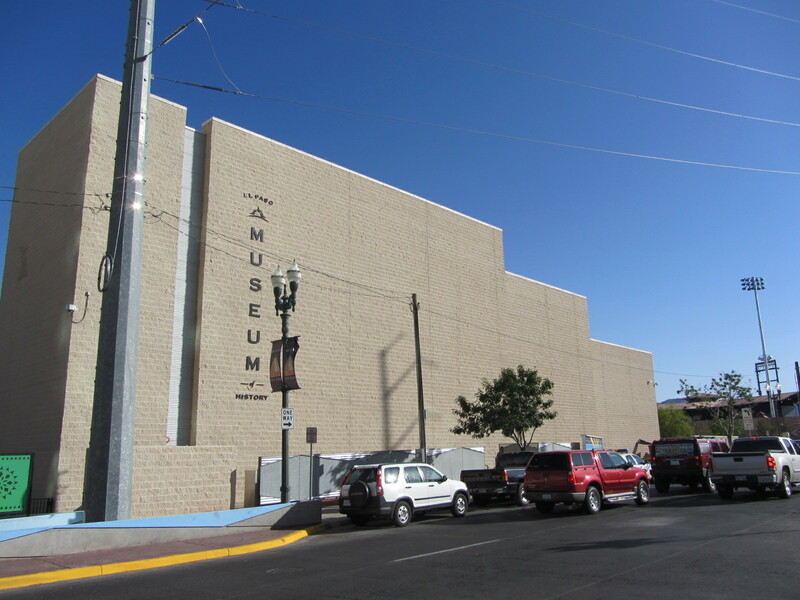 Juarez is in the Mexican state of Chihuahua (hence the team name), and residents of the city represent, at least potentially, a sizable portion of the of the fan base. Turning inward, and then outward again. 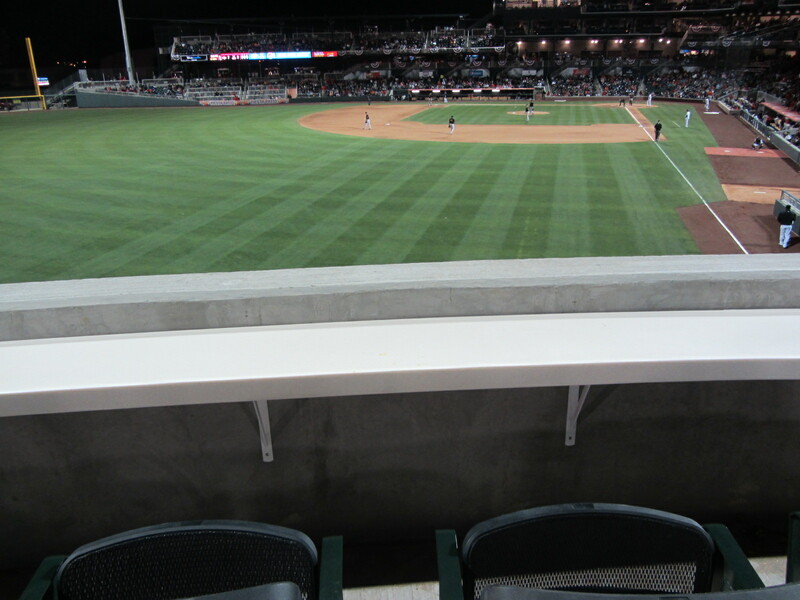 That picture was taken through a window, as I was standing in a hallway located outside of the suite area. 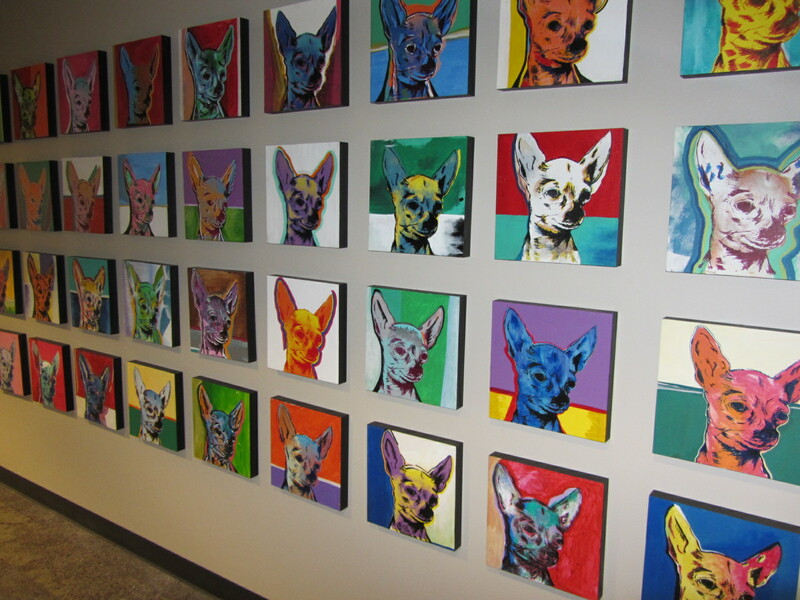 This area is decorated with a surprisingly diverse array of artwork. 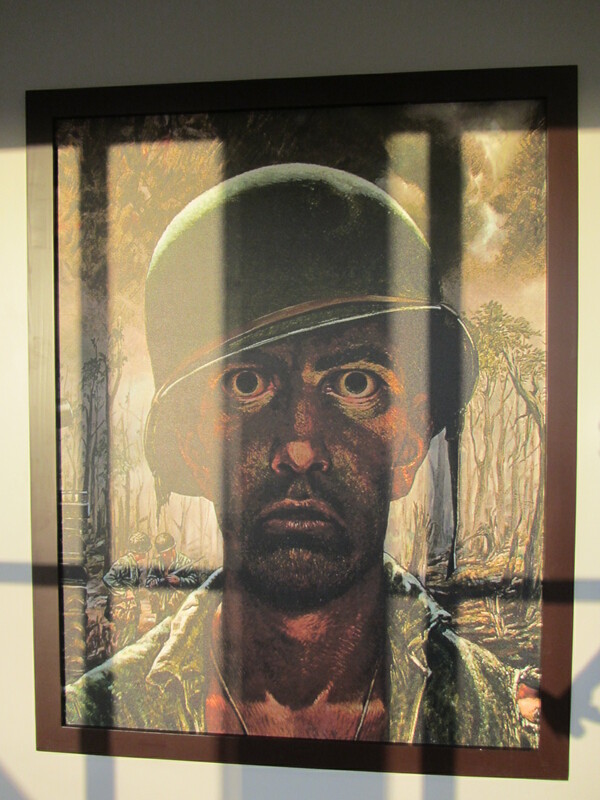 This is Tom Lea’s The 2,000 Yard Stare, a famous portrait of post traumatic stress disorder and the visual equivalent of a punch in the gut. 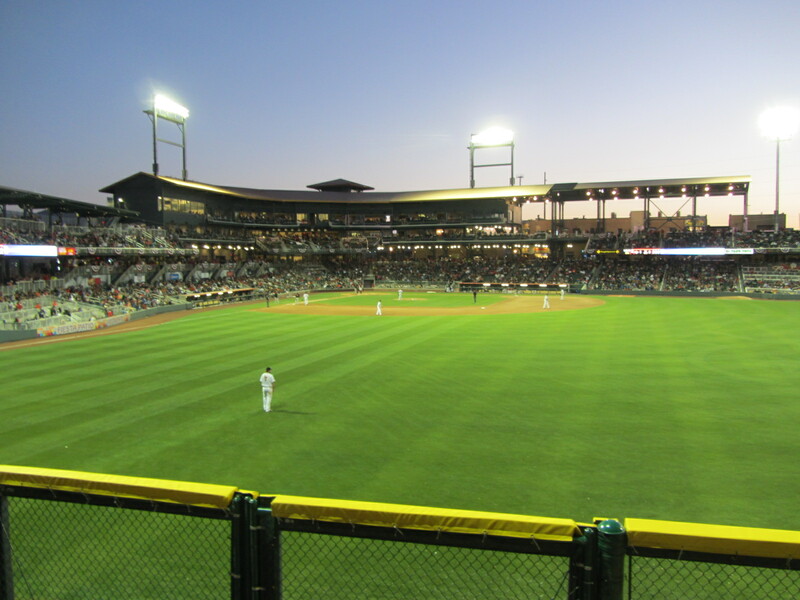 Around this point in the evening I ran into Chihuahuas general manager Brad Taylor, and he led me on the so-called “nickel tour” of the ballpark. 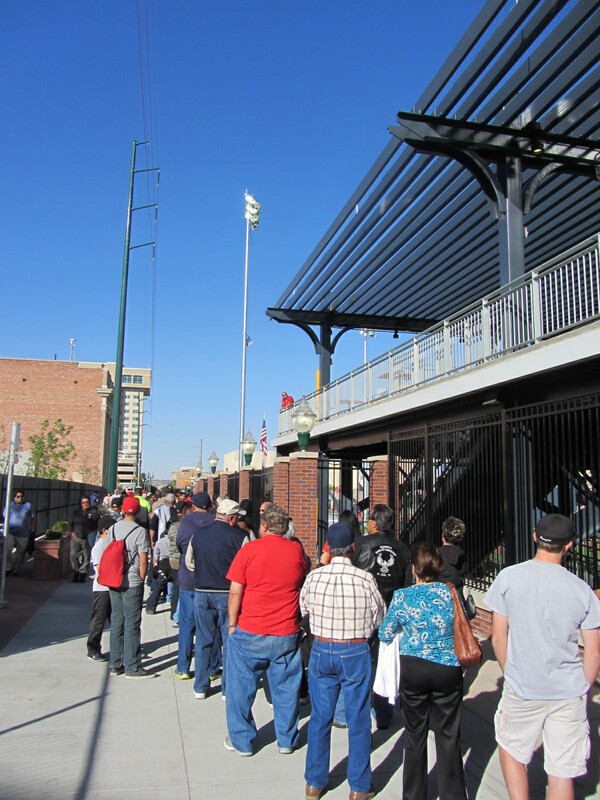 Specifically, he wanted to show me the aforementioned three-story brick structure that sits just beyond the right field fence. 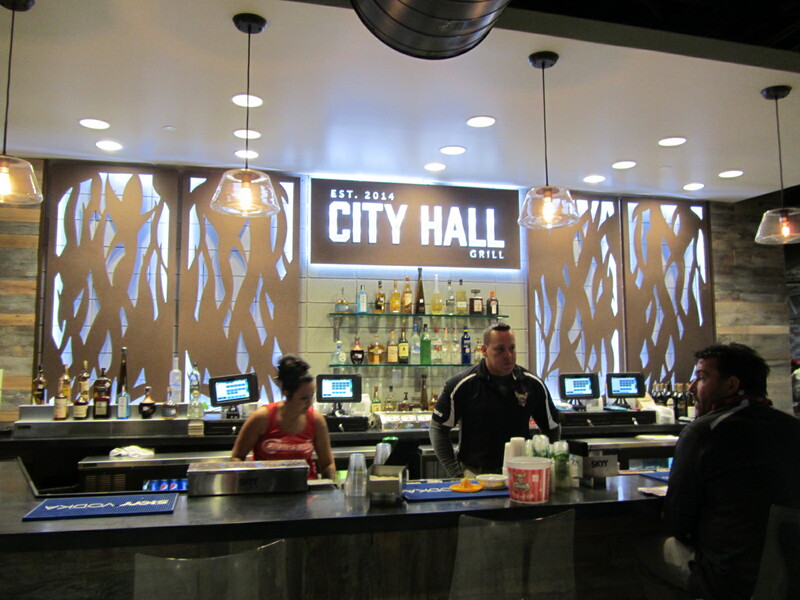 It is called “The Big Dog House,” and the first level houses the City Hall Grill. 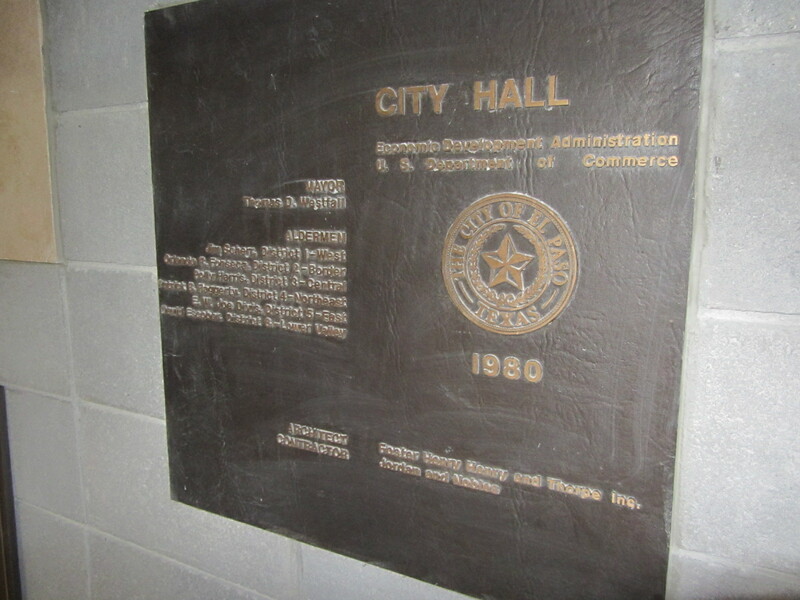 This plaque is currently displayed in the City Hall Grill. 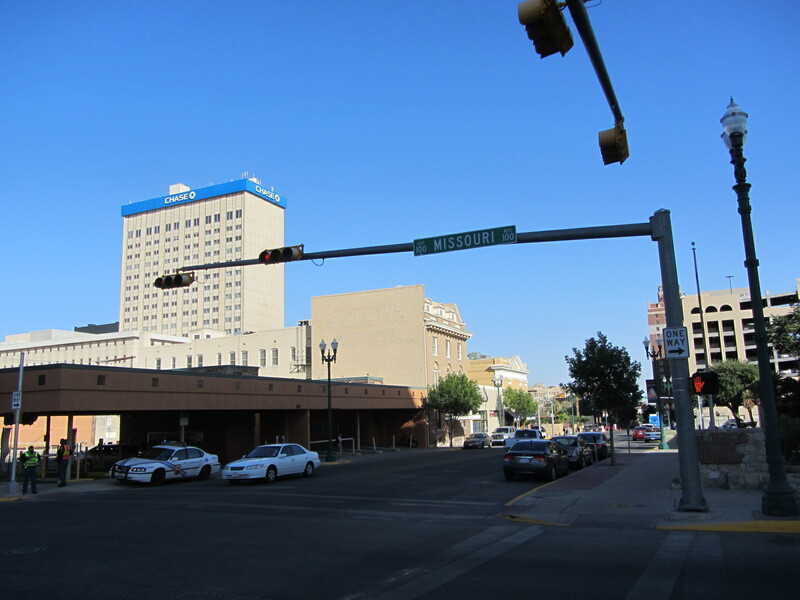 We then walked up one floor, to the Sun Kings Saloon. 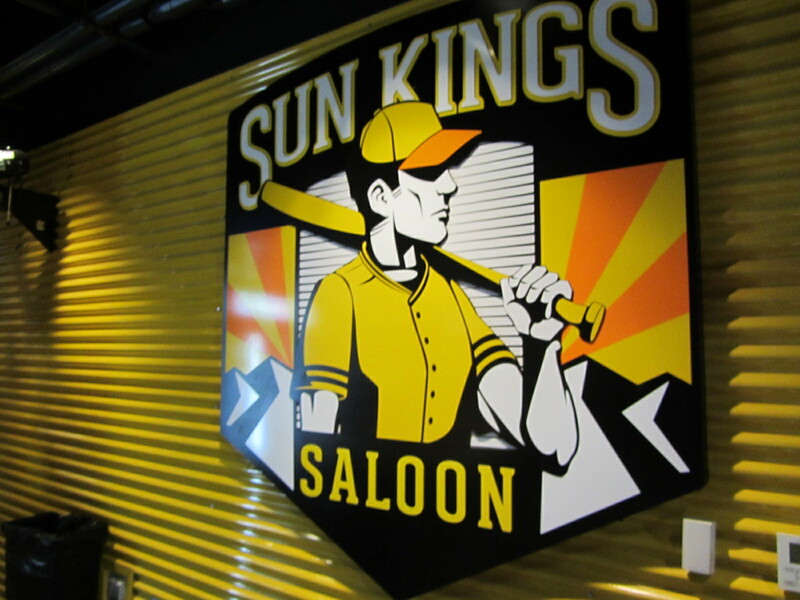 The Sun King Saloon is named after one of El Paso’s former Minor League entities (the Sun Kings were not blown up in order to make room for the Chihuahuas, however). 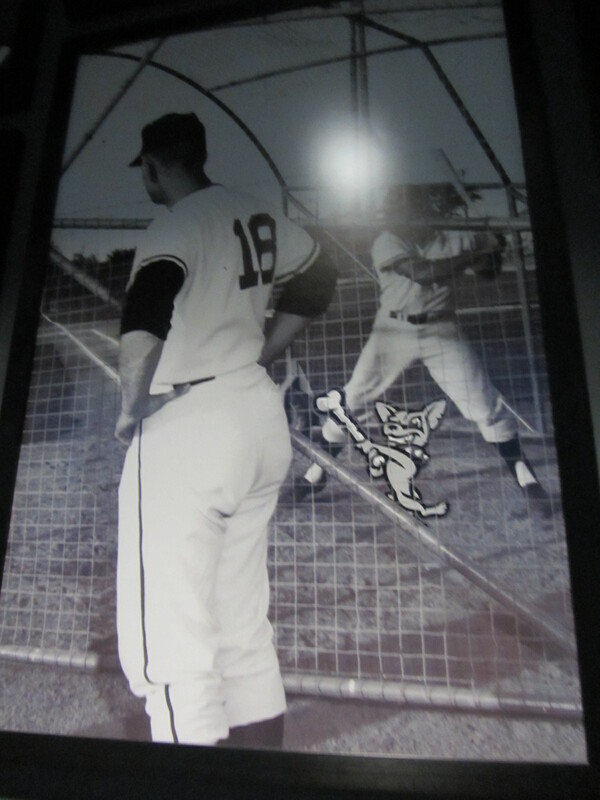 The walls of the saloon are decorated with El Paso baseball memorabilia, often with a Chihuahuas twist. 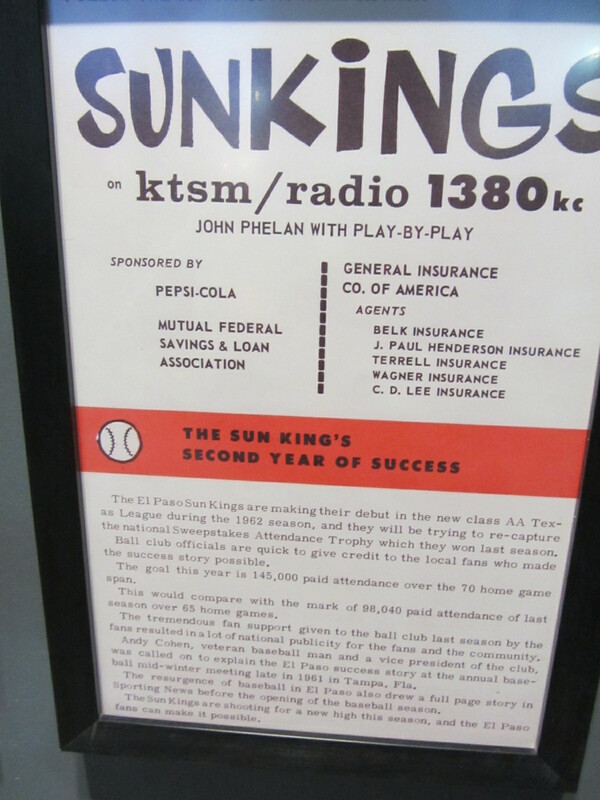 This advertisement is interesting, in that it lauds the Sun Kings as a Minor League Baseball success story as a result of almost drawing 100,000 fans in their debut 1962 season. 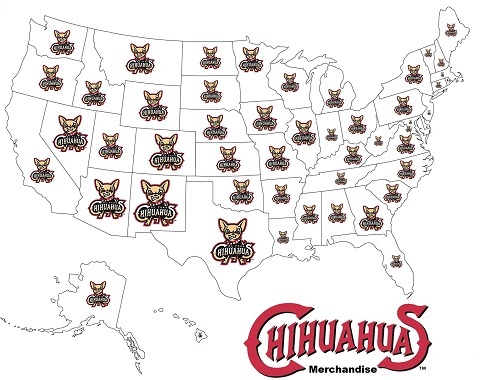 It’s comparing apples and oranges, but I’d be surprised if the Chihuahuas draw less than 600,000 in 2014. 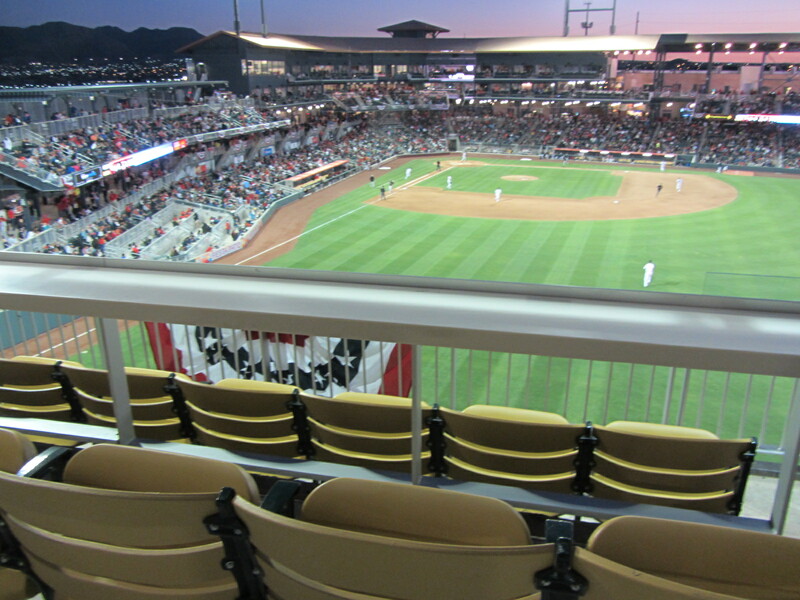 Finally, at the top of the building, one finds the “Wooftop Deck.” It was largely empty on the night I visited, but this would be a great place to watch the game! 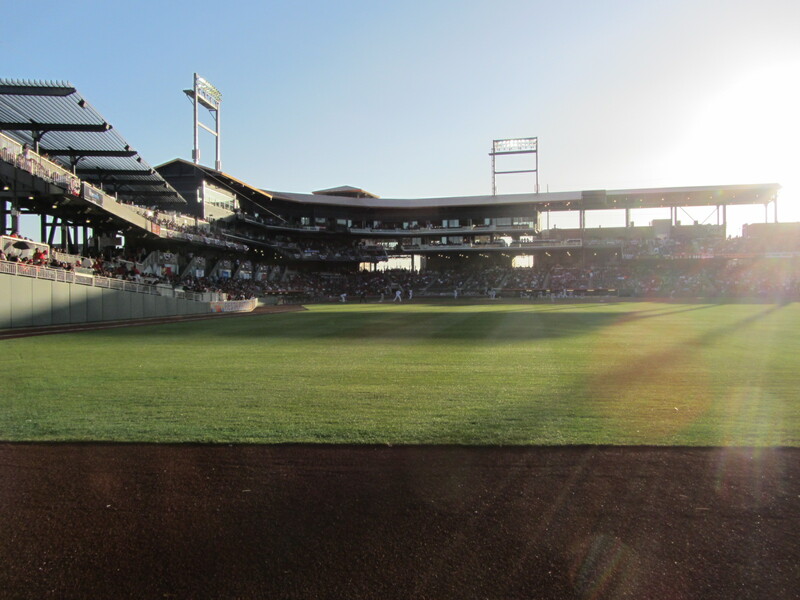 Somehow my next picture is from the far left field corner of the stadium. I guess we walked over there. 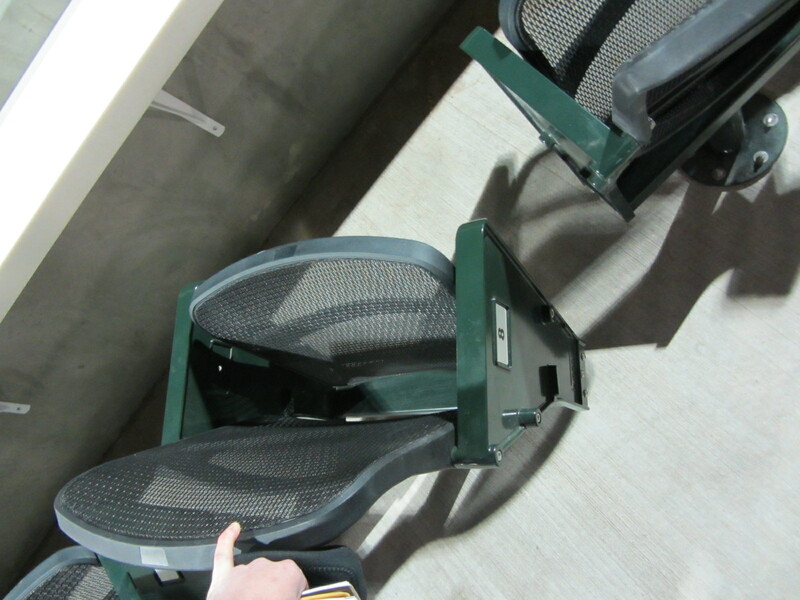 The seats out here, they swiveled! Swiveled, I tell you! 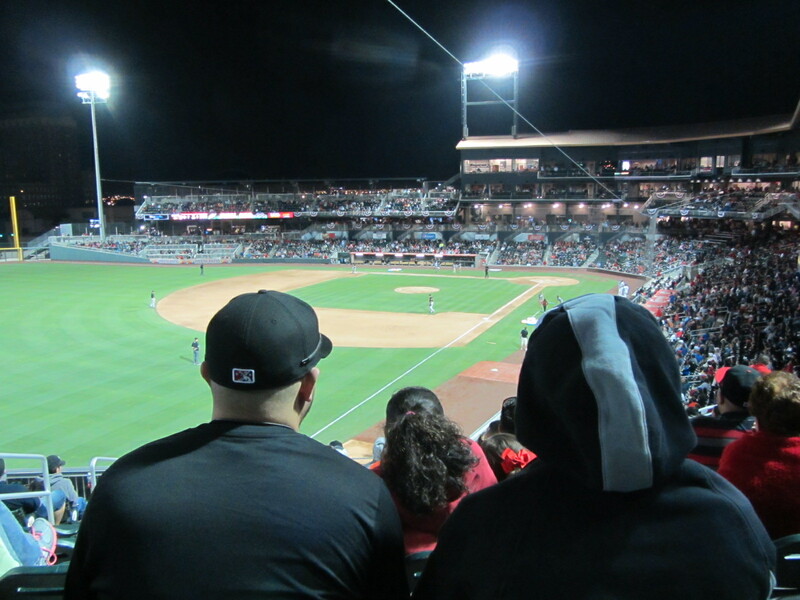 Part Two of this El Paso Chihuahuas saga shall appear on Monday, then. It’s gonna have a lot of pictures of food. But enough about me! 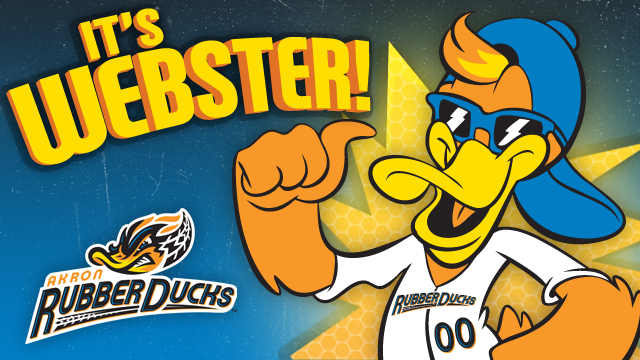 Did you know that, in recent weeks, several new Minor League mascots have made their debut? I am sensing a profoundly ambivalent response to that query, but soldiering on in the face of ambivalence is what I do best. 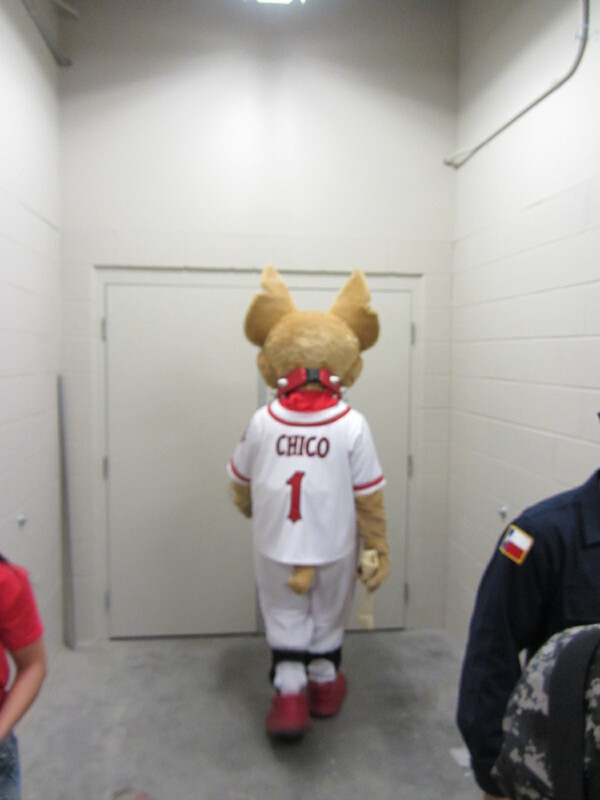 Therefore, let’s start with Chico of the El Paso Chihuahuas, who I will be able to meet in person on April 29th. 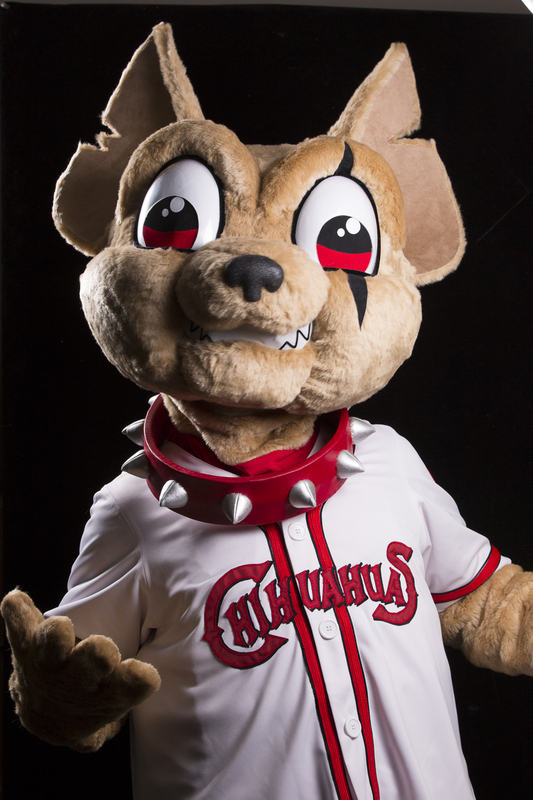 Say what you will about the Chihuahuas name/logo/overall branding efforts, but one thing they are definitely not is bashful. 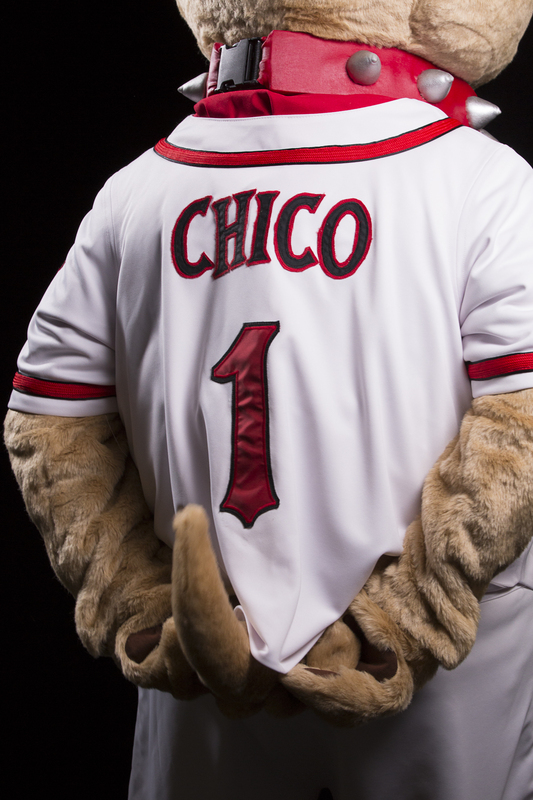 Chico, who came into the world without even a scintilla of an origin story, is IN YOUR FACE. From the rear. This photo could in no way be misconstrued. 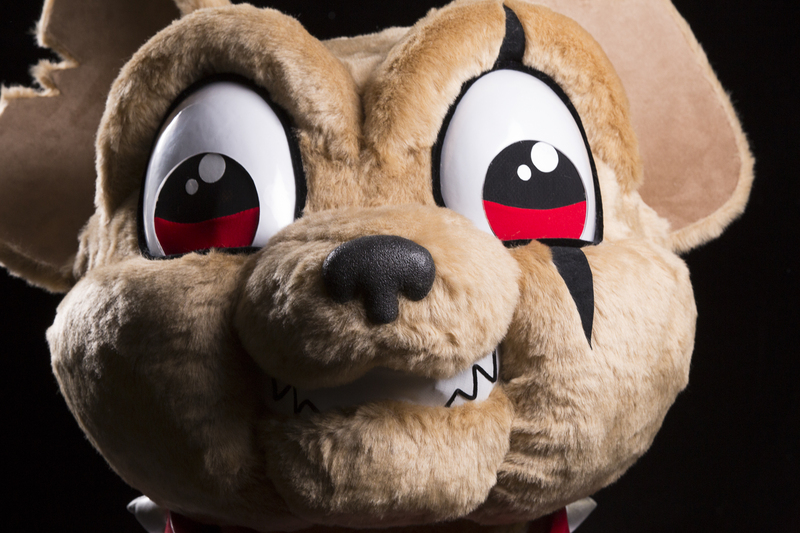 I do my best to refrain from lazy “only on the internet” phrases such as “nightmare fuel,” but there’s no doubt that Chico has a bit of an edge too him. 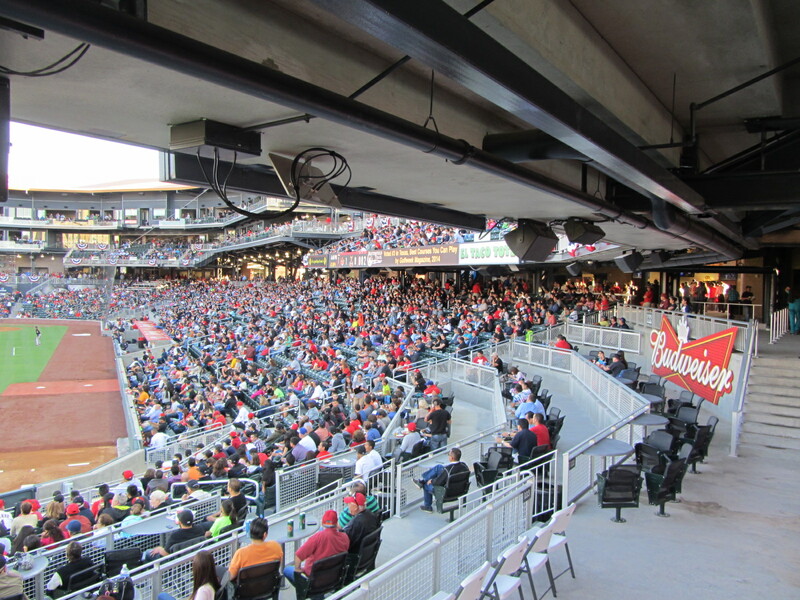 He’s got red eyes, a dog collar necklace, and a cockeyed, teeth-baring grin, three presentational elements that are rarely associated with the Minor League mantra of family-friendly entertainment. 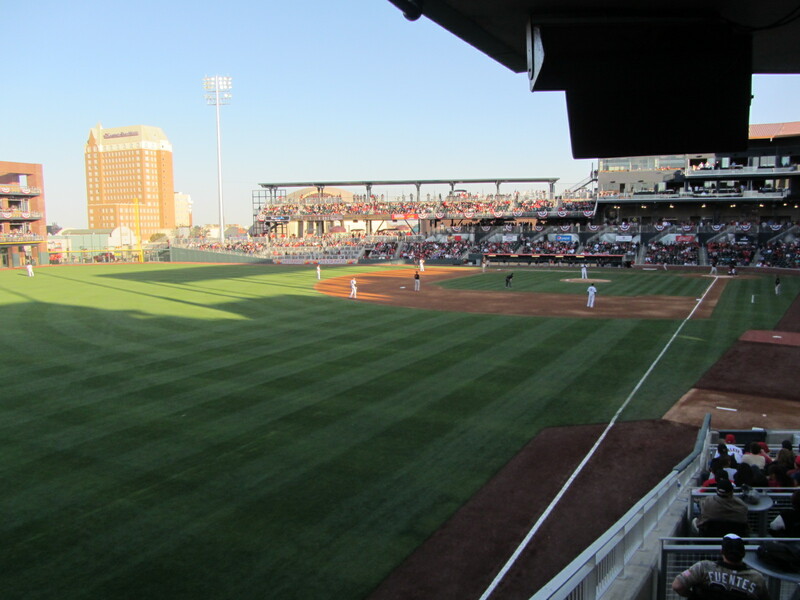 El Paso Chihuahuas — on the cutting edge, or missing the mark? I have a feeling that Chico doesn’t care what your opinion is, whatever it is. He will be performing for a fan base that includes Pauly Shore and Cheech Marin (really! 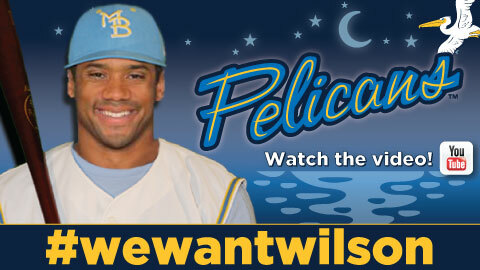 ), so chances are that he’ll fit in just fine. 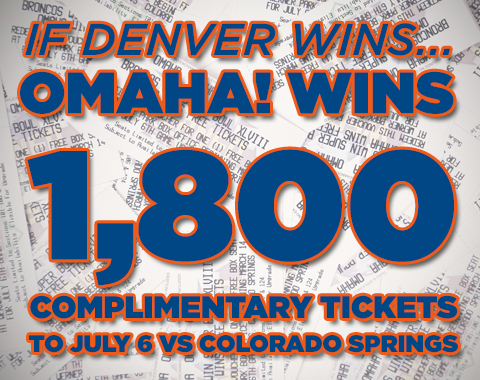 And, yes, let’s get this out of the way. 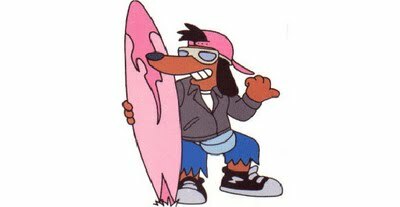 As noted by more than one of my Twitter followers, Webster appears to be Minor League Baseball’s version of “Poochie,” the superfluous Itchy and Scratchy sidekick whose cynical conception and even more cynical demise was the subject of a classic Simpsons episode. It turns out that, in the flesh, Webster is downright endearing. Chances are slim that he will die on the way back to his home planet, I look forward to meeting him when I visit Akron on July 18. 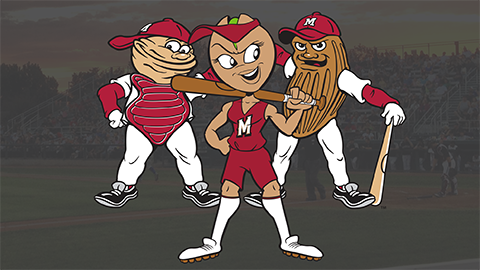 Out in Modesto, Al the almond and Wally the walnut have long held things down on the mascot front. 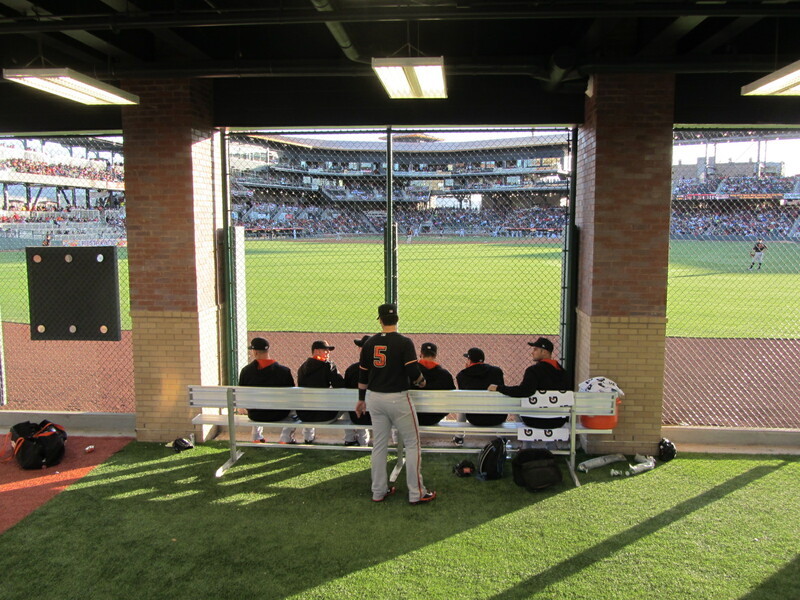 You’d think that the team would be content with displaying their pair of nuts at every home game, but, no, they want more. Get ready for a female pistachio! Like all female pistachios, this one needs a name! 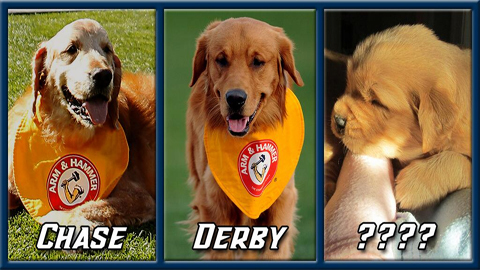 Fans are invited to choose among Penny, Patty, Shelley, Bella, or Polly, but why isn’t “Ms. Tachio” one of the options? I need to start a consulting company so that such wordplay opportunities are always taken advantage of within the industry. I would be good at this, and you know it. 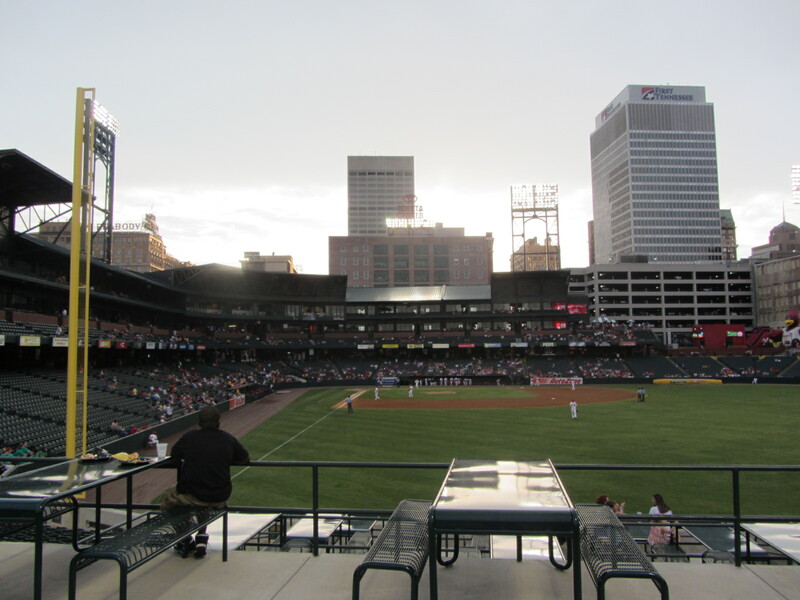 Ace is a native Arkansan who grew up rooting for the Travelers. He proudly served his country and upon returning to the Natural State competed and won the Mascot Tryout. With a name like “Ace” of course he is a pitcher and stands at a very menacing 7′ 2″ tall and weighs 501 pounds with a size-36 hoof. 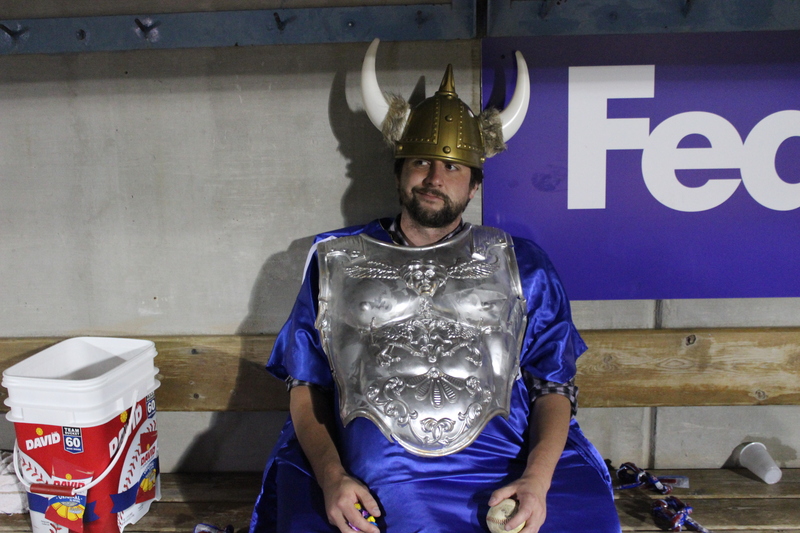 At 7’2″, Ace’s height is even greater than former Arkansas Traveler Loek Van Mil! 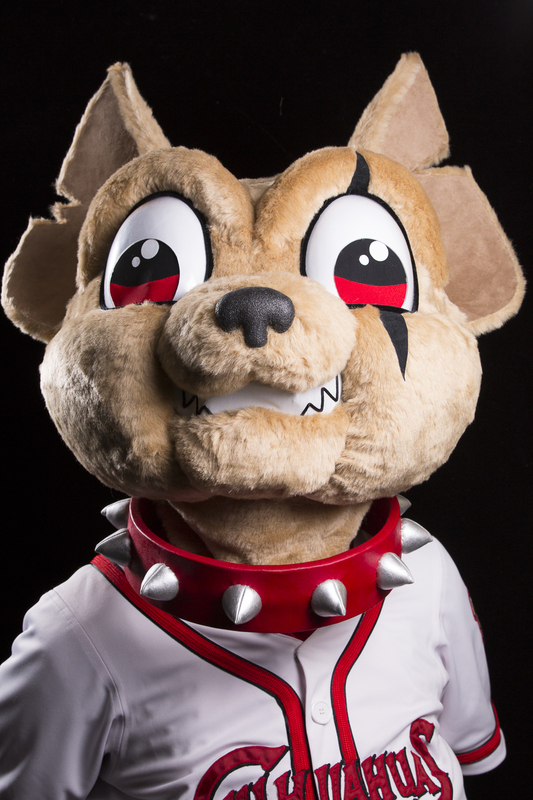 This, also from the Travs, might be one of my favorite mascot bios in recent memory. 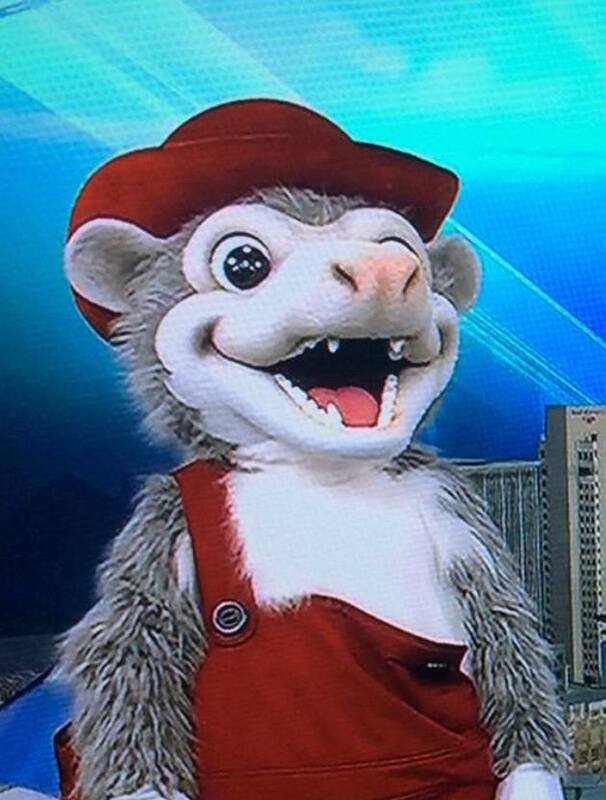 Initially the idea was for just one mascot, but when Ace introduced the Travs and Hughes Agency to his best friend “Otey the Swamp Possum” during the interview process all bets were off. 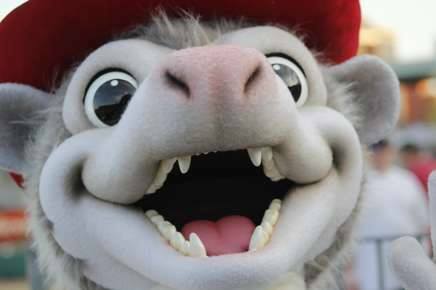 Just like Ace, Otey is also native to the state hailing from Southeast Arkansas. 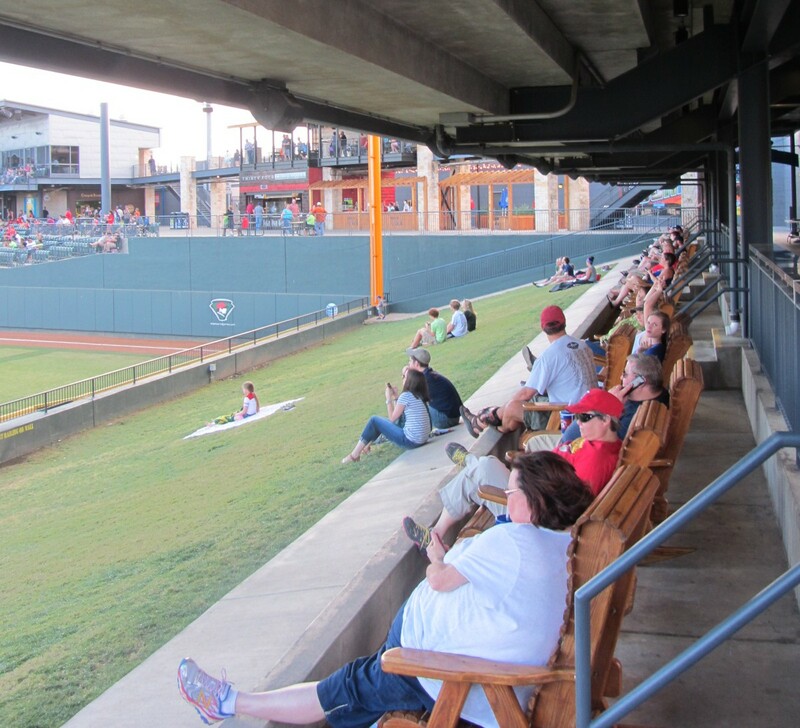 He grew up watching Travs games with his family from underneath the stands at Little Rock’s Ray Winder Field. 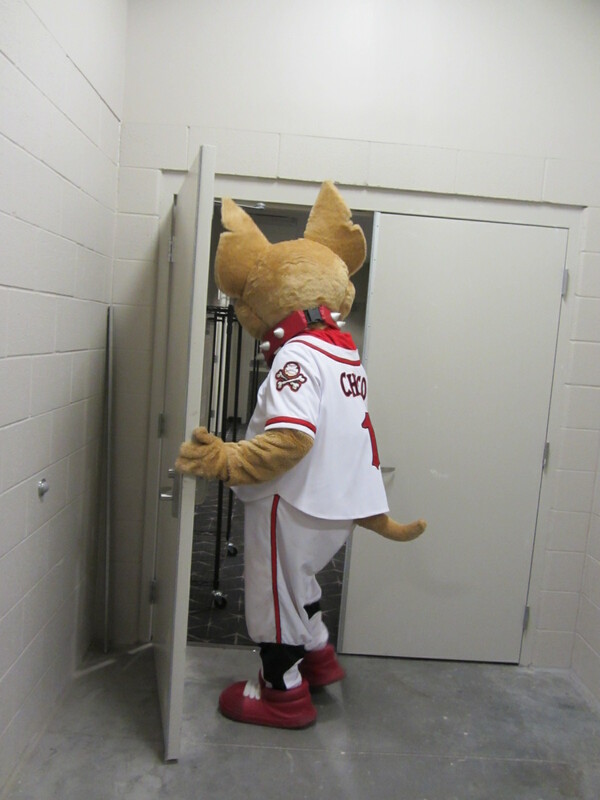 Otey, who was named after former Traveler infielder and groundskeeper R.C. Otey, claims that he is the Travelers’ “Good Luck Charm”. 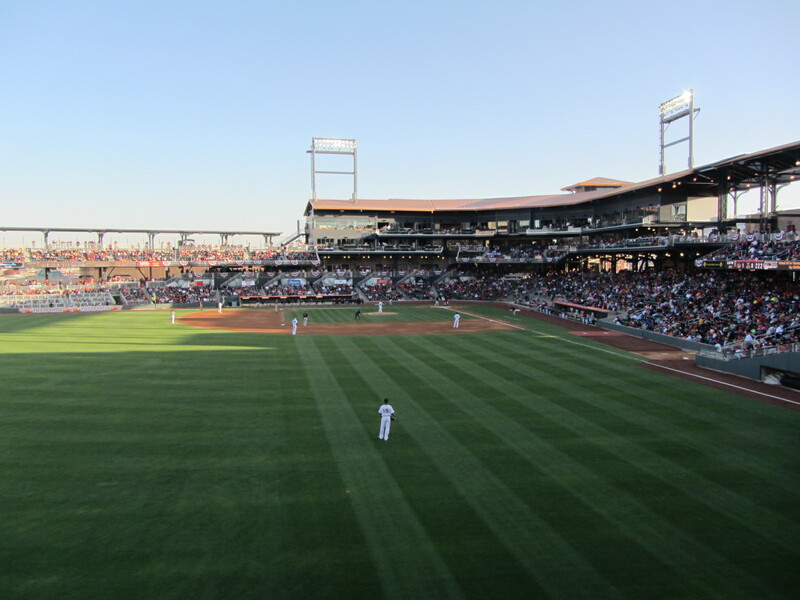 In fact Otey believes that his superstitions helped the Travs win the 2008 Texas League Championship even though their 62-78 regular season record was the worst for a champion in Texas League history. Otey stands a stout 5 feet tall, he is a fan of second base and the “phantom double play” and his favorite number is .984, which was R.C. Otey’s career fielding percentage. And with this memorable bio comes a very memorable mascot. Otey inspired a brief burst of snark and faux-outrage from amateur hour internet hyperbolists, but so what? 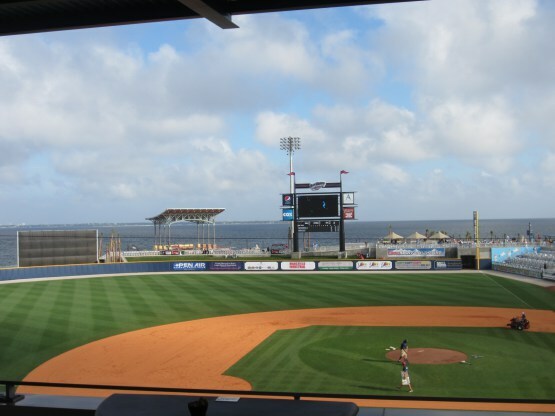 As Otey’s bio makes clear — and this is something I learned firsthand when I visited in 2012 — the Travs and their fans have a strong nostalgia for their colorful Ray Winder Field past. 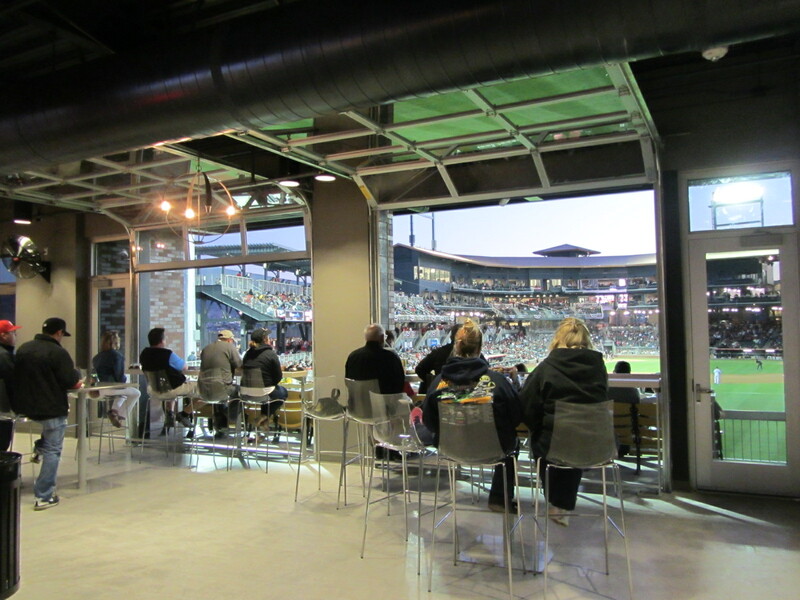 So much so, the beer garden at their current home of Dickey-Stephens Field is named after a well-known and often well-lubricated fan who would slide, in shorts, into a popcorn box base. Otey should fit right in. And with that, it’s time for me to hook slide on out of here.